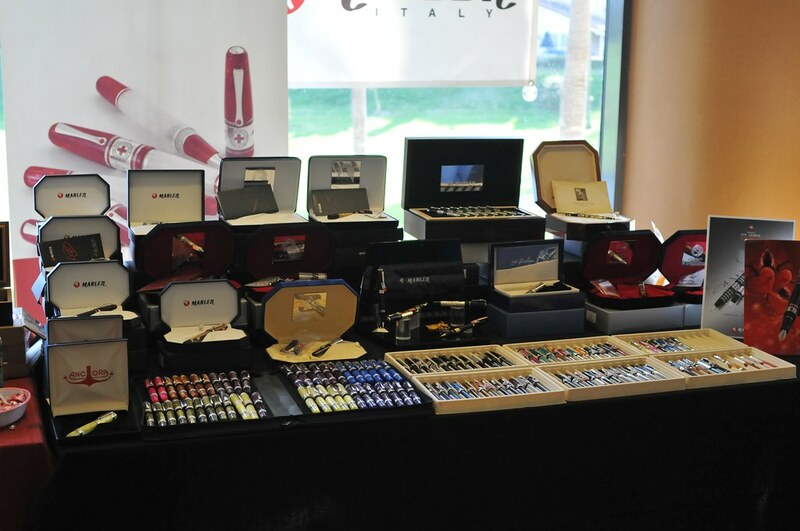 I finally made it back from the LA pen show and here is my report on the show. The show was an incredible blast. The best part of the show was not the pens at all. 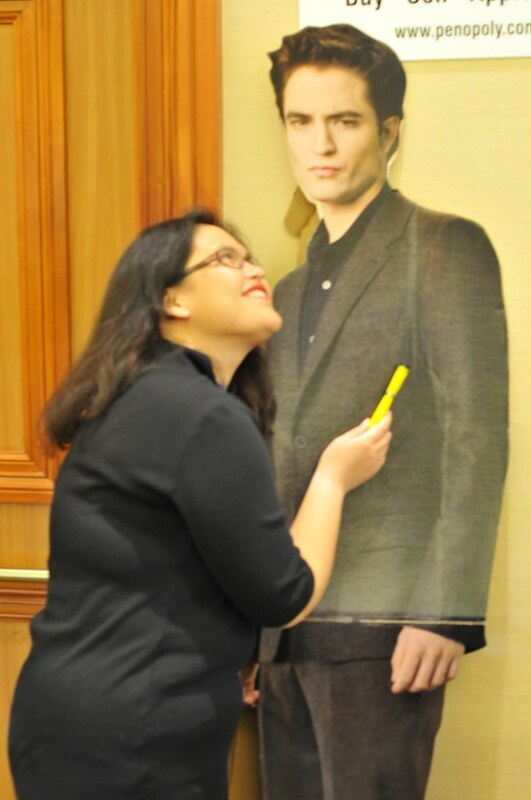 I'm not going to even think much about the pens I bought until I get all of pics up on FPN. Ok. I did ink THE pen. 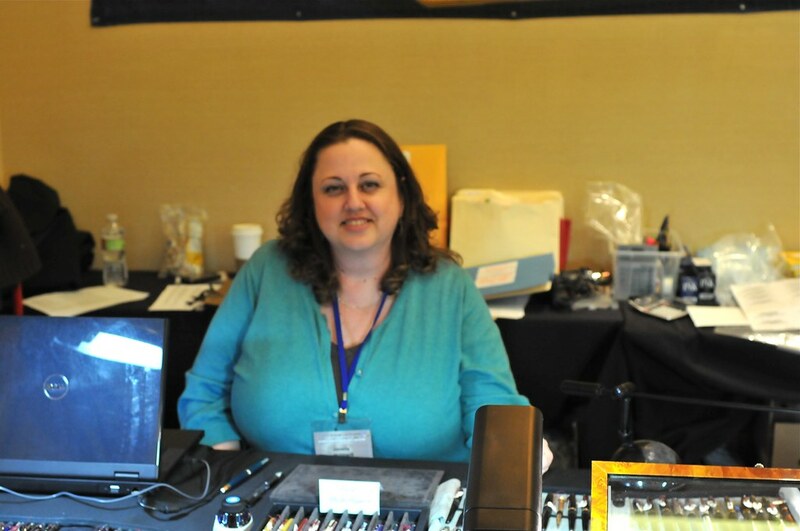 The best part of the show was meeting all of the great people in the community, putting faces to all of the FPN members, having great friends like Lisa and Deidre helping me buy pens, Kevin's party, and hanging with the "inner sanctum". But I'm getting ahead of myself. Thursday was the first day of the show and it was really a set-up day. 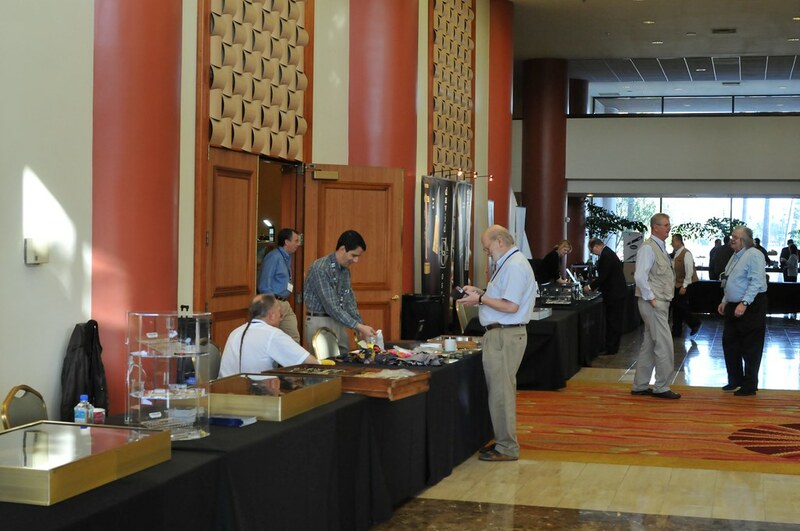 Dealers were arriving all day long and set-up was happening at an organic pace. The great thing was that the weather was very nice. I've had had enough of the rain. 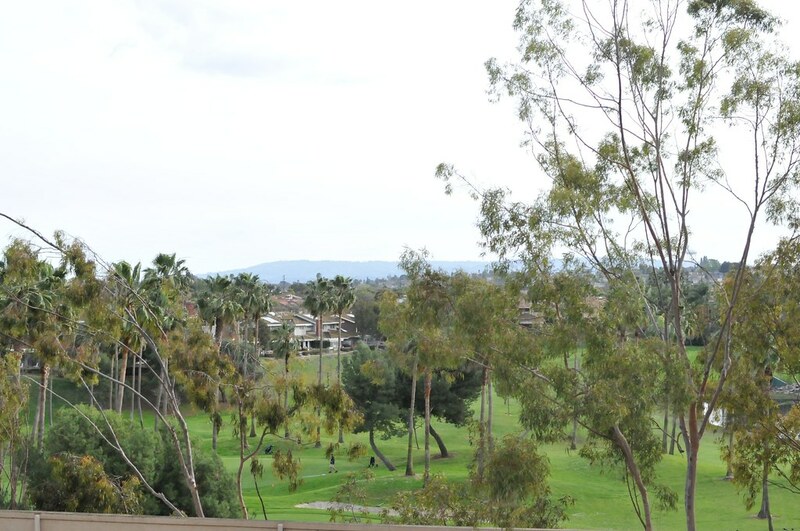 Here's a view from my room. 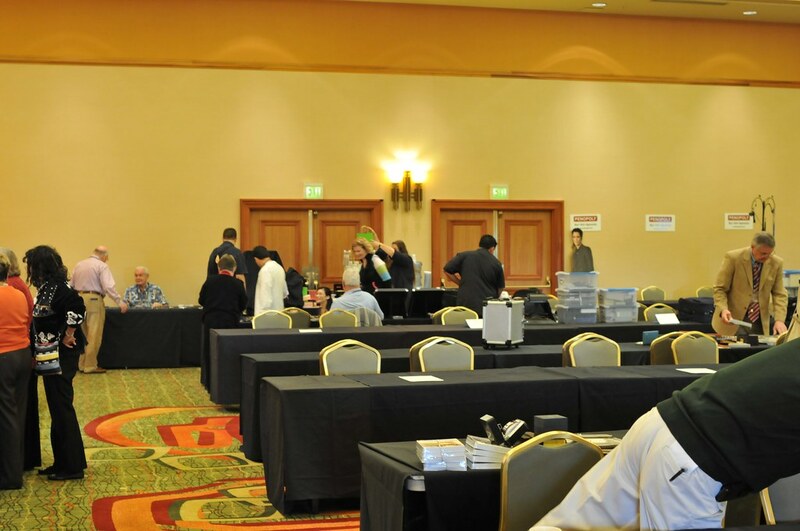 Even though people were still arriving and setting up, the pen selling and trading were already in full gear. 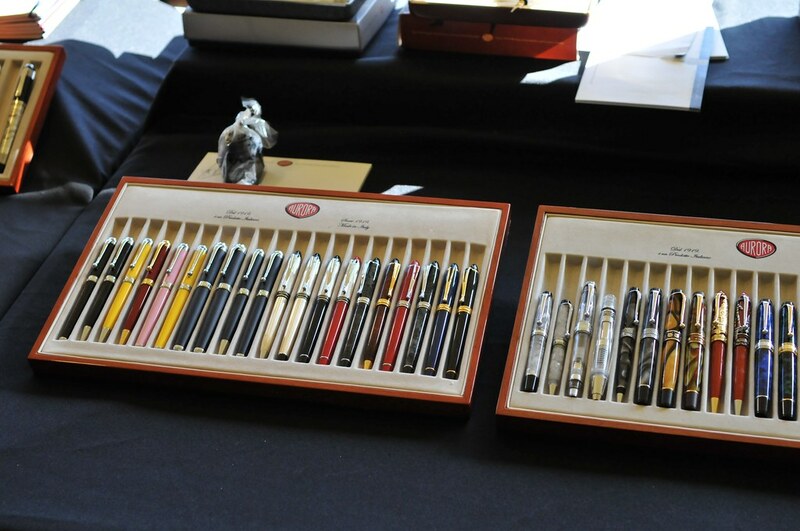 As I was told by a veteran, Thursday and Friday are really dominated by vintage pens. 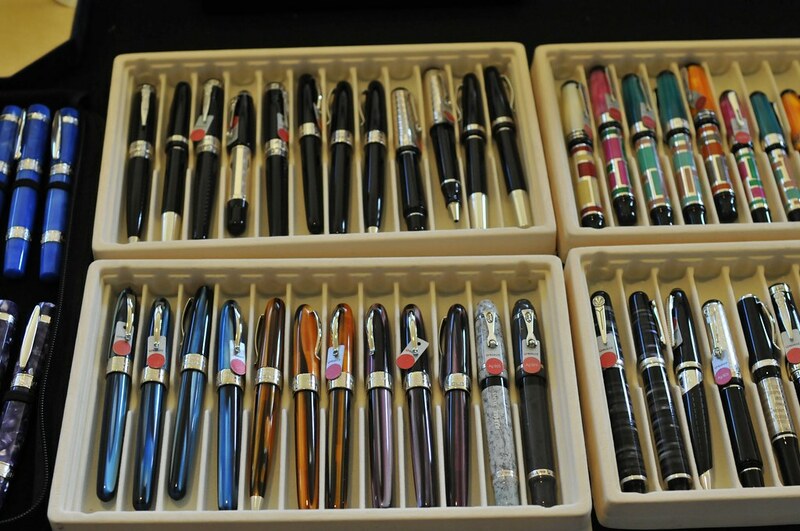 I had never seen so many Parkers and Sheaffer pens in my life. 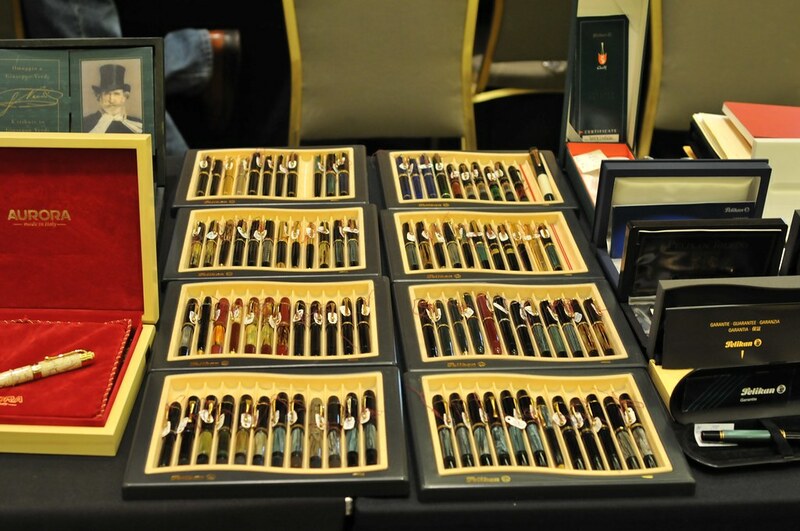 Almost all major and many minor makes of vintage American pens were represented. 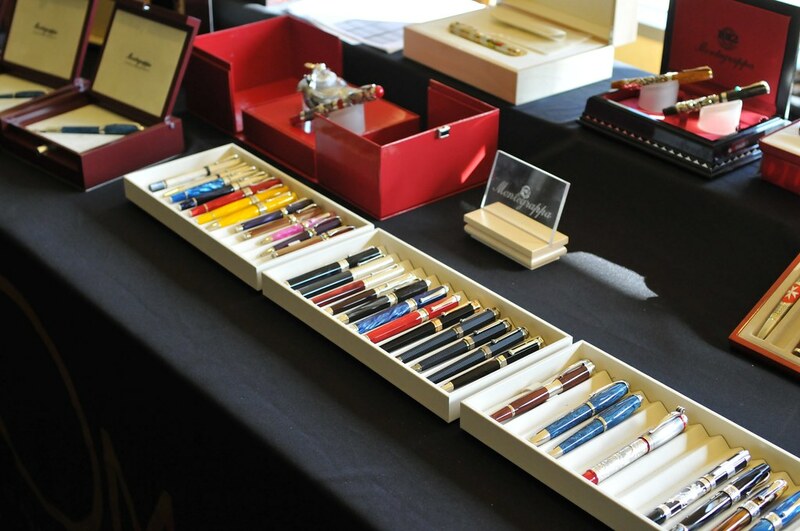 When I arrived, there were no Japanese pens, no modern pens, no vintage Italian pens, etc. Susan Wirth was tireless the whole show. She was already set-up when I arrived. 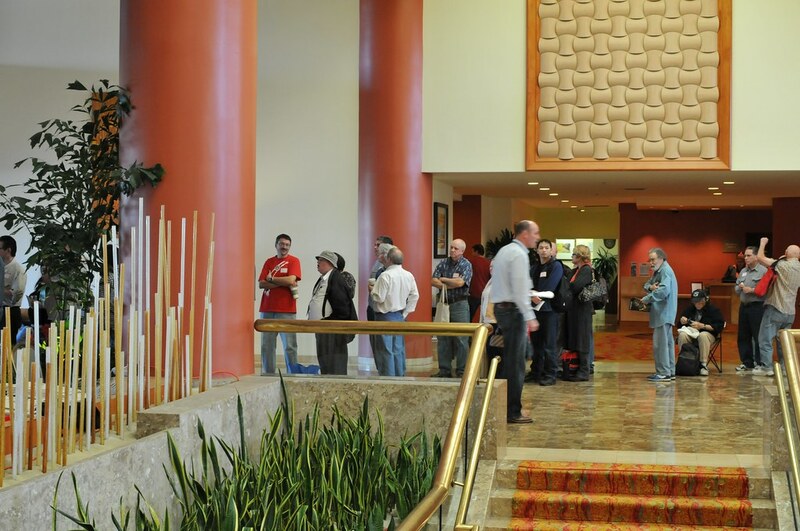 Even though it seemed like there were not that many people, deals were being made in the main room and outside. 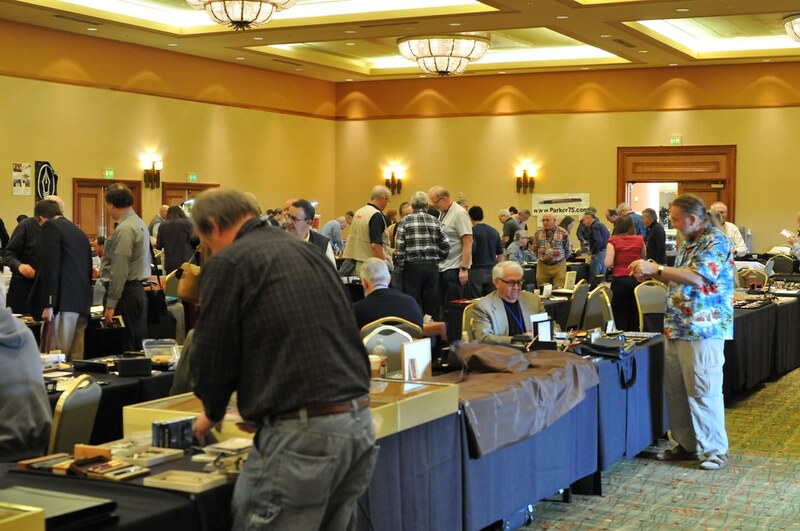 Most of the people here are long time collectors (vintage) and know each other. 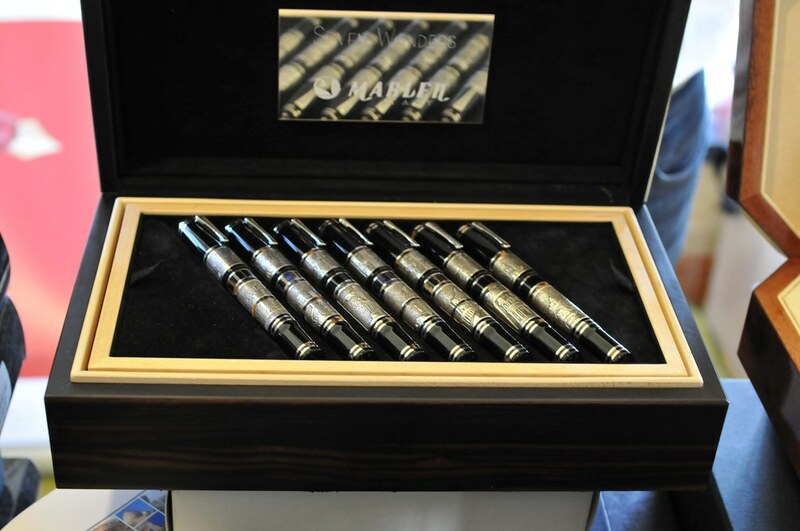 It seems pens were flowing from one collector to another. Since it was not crowded, the show had a very leisurely atmosphere. 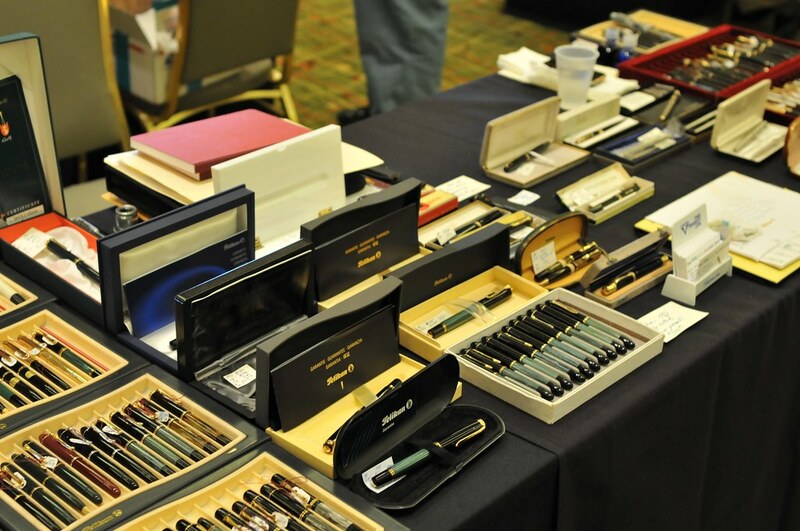 As it got later in the afternoon, some of the modern pen dealers and accessory dealers started to show up. It wasn't until 4 that someone showed up who sold ink. 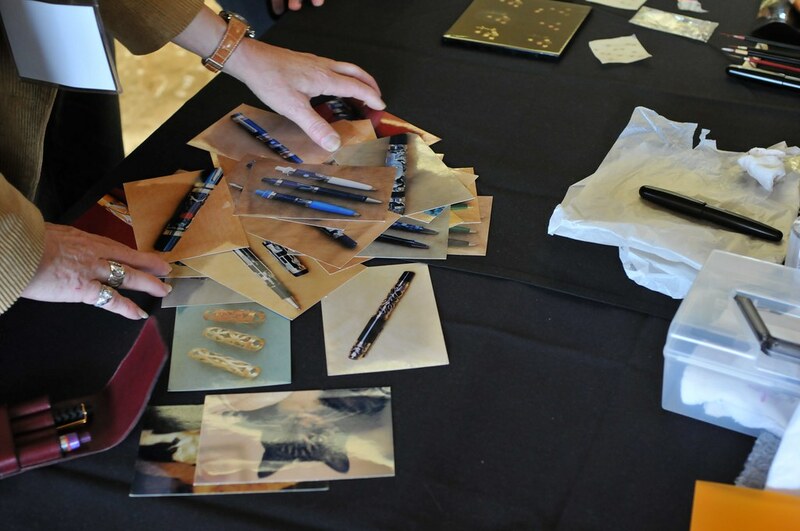 It was funny since many of the vintage guys did not bring ink and were trying to figure out who had some they could test pens. I spent the first day just getting the lay of the land. The only pen I bought was from Deidre since she had a vintage Italian pen for sale and no else did. That's all for the Thursday recap. On Friday, the show really got started. 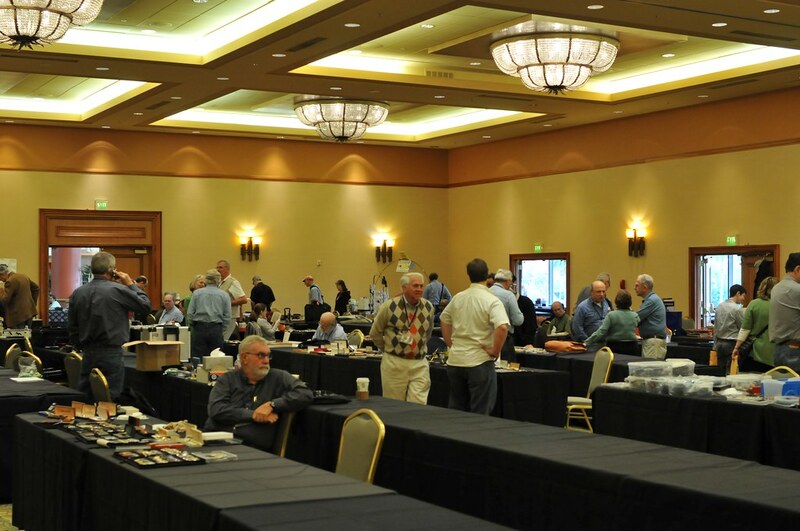 A fair number of dealers and B & M stores arrived late Thursday so that Friday was very active. 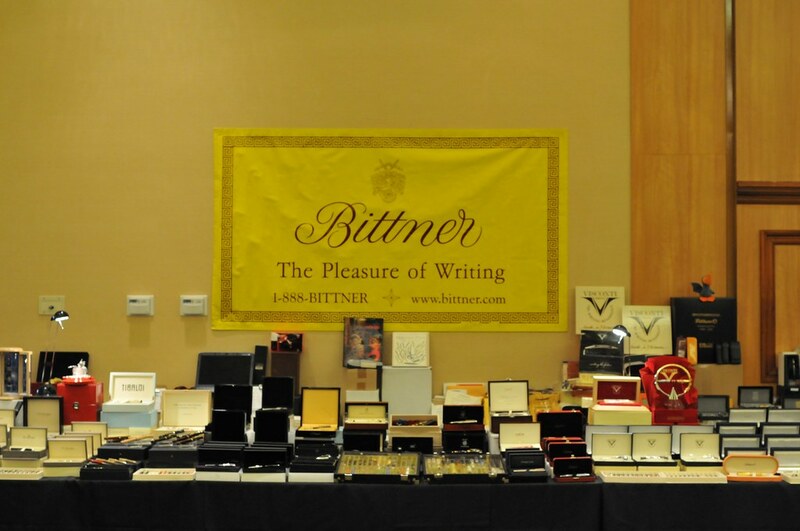 The show was still slanted towards vintage but a number of modern pen dealers such as Bryant, Bittner's had set-up so the pen selection was more diverse on friday. 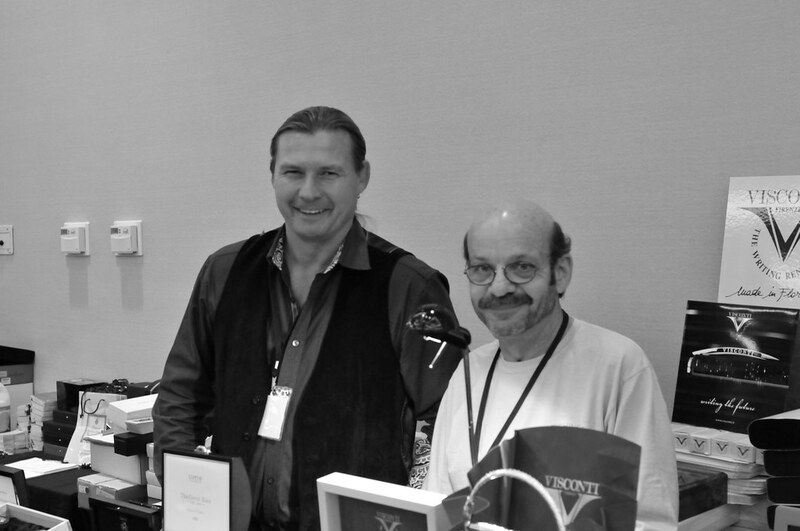 Detlef and Bob (Bittner's) in mono (the camera was accidently set-up for monochrome and the color pic was not as good). Bryant (the official evil pen dealer) Squeeee! Squeee! It was great to finally meet Bryant in person. I feel so connected to him since I gave him all that money last year. 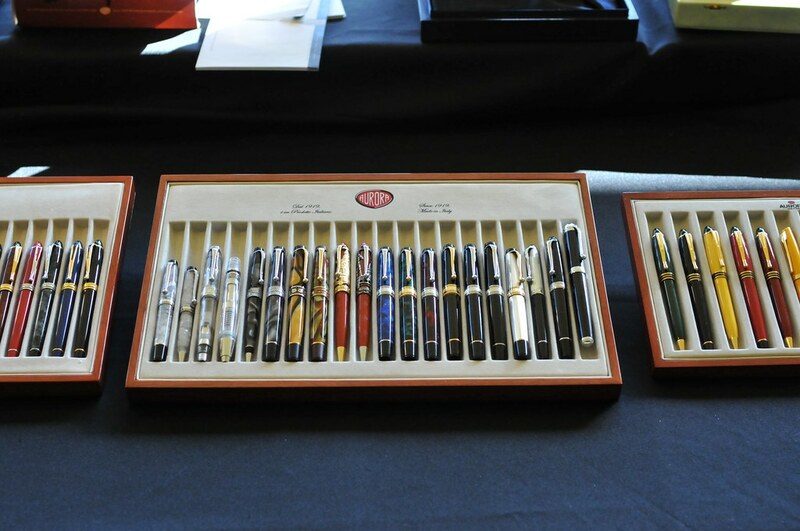 Bryant had an incredible selection of moderns pens at great prices. He even let Ethernautrix and myself write with his Skeleton 333. Anyways, heads up Bryant fans. (GhostPlane, Silvermink, Repriev, Jlepens, .....) Bryant has some more cool stuff cooking on the stove. So save your pennies. I won't spoil the surprise. Deidre and I were already picking edition numbers. 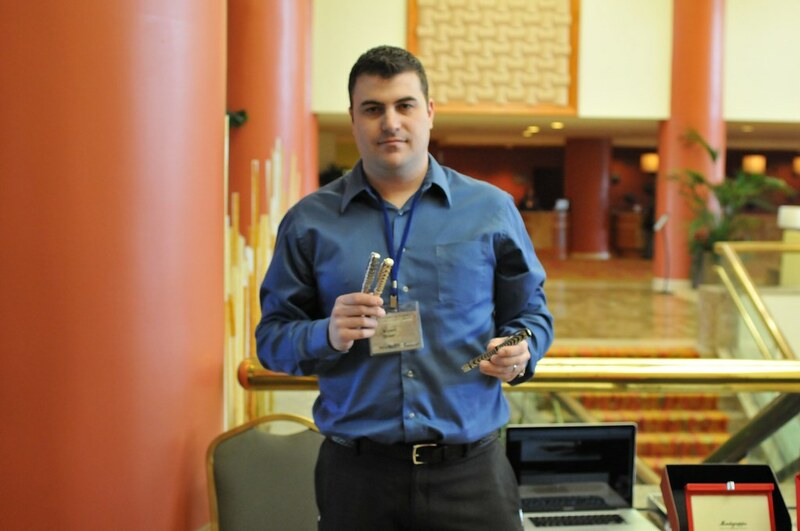 It was funny meeting Brian Gray in person because I've seen him work via his webcam. I told him he looks a lot younger in person. It must have been the camera angles. 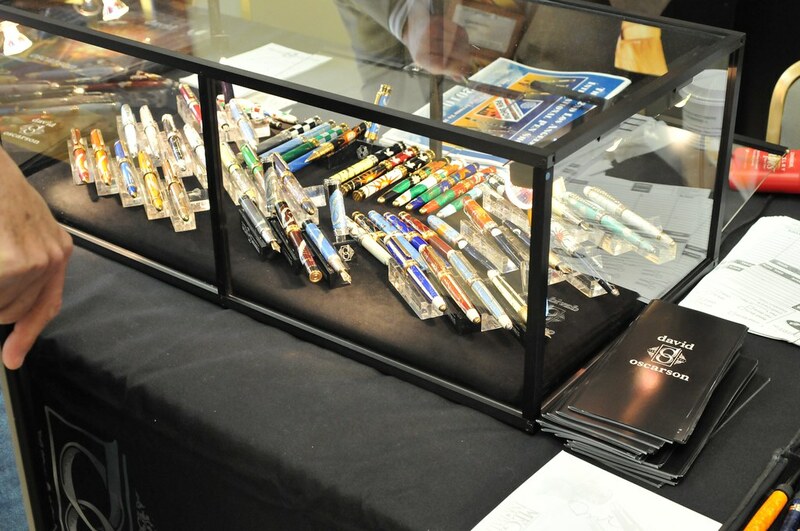 Brian had a full display of his pens. On Friday, it was not so busy so had a chance to chat with Brian leisurely and buy a pen. Brian's works keeps getting better and better. 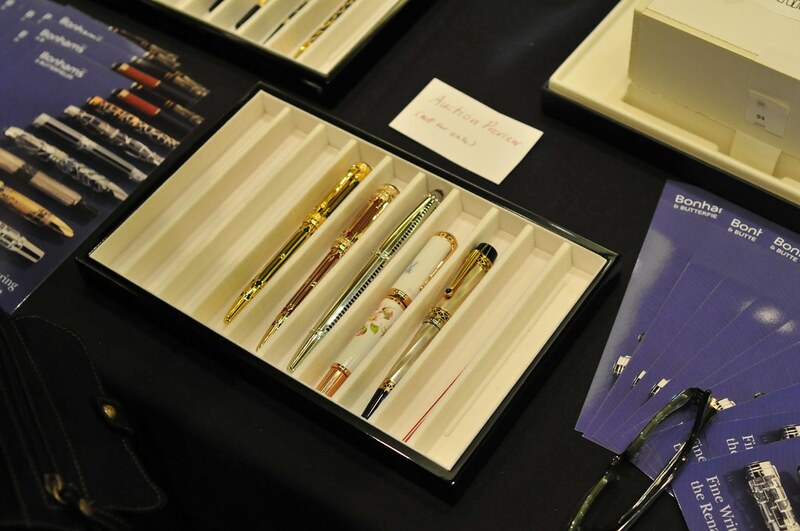 Some of Brian's pens minus the one I bought. 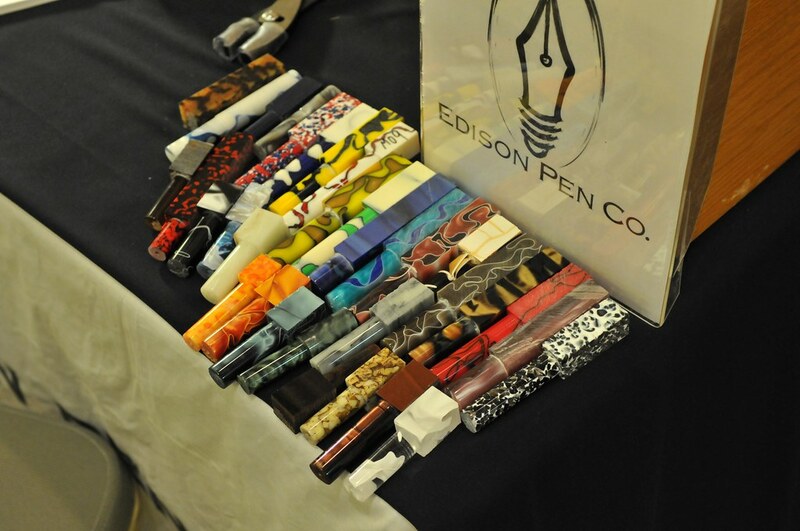 David Nishimura (vintagepen) new celluloid and ebonite stock is helping guys like Brian make beautiful new pens. This new upcoming celluloid is stunning. 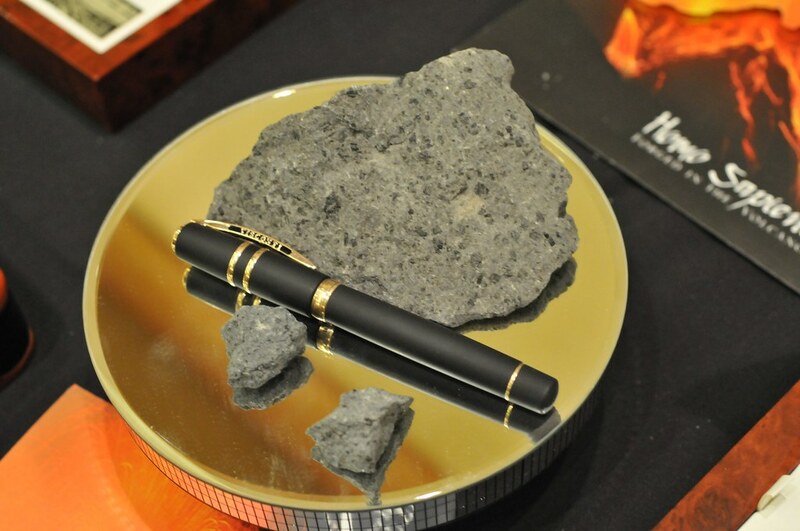 Brian Gray already has a waiting list of customers who want pens out of this stuff. Here is our very own Stan. 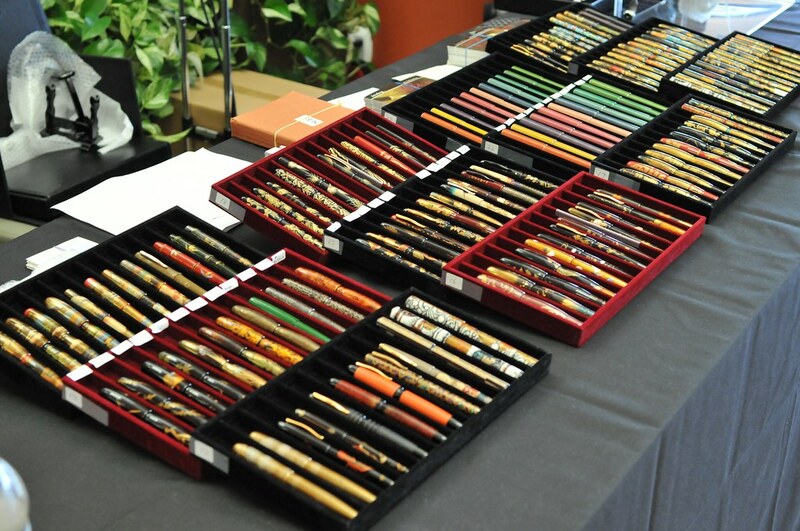 I raided his table and scarfed up a bunch of vintage Japanese pens as soon as he set-up. It was great talking to Stan in person. I picked up all kinds of information of Japanese pens. 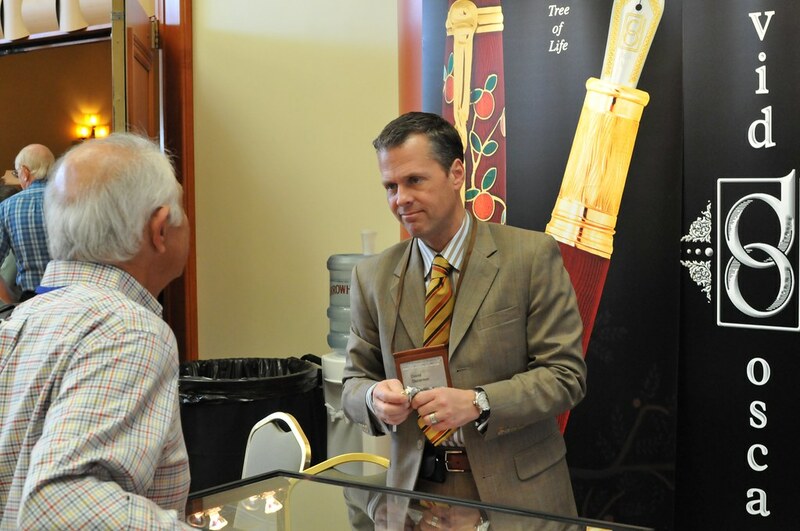 One of the great aspects of the show on the tarder days is that you have time to talk to people and learn from the guys with years of experience. 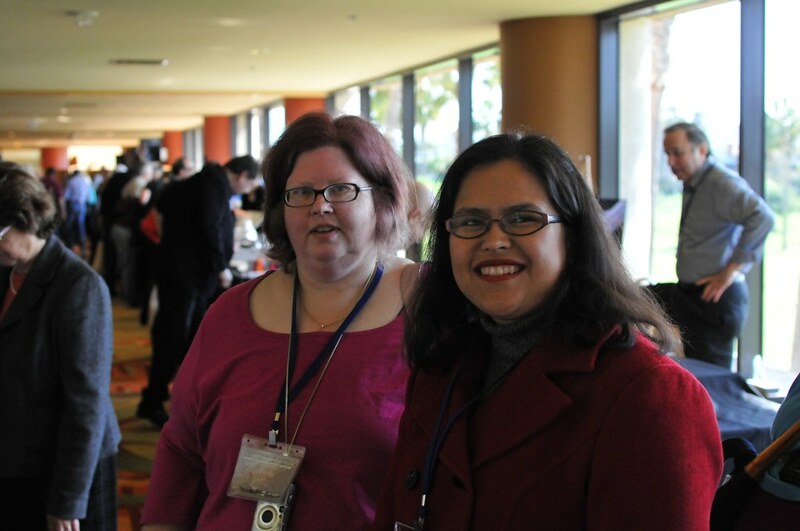 Another great FPN person to talk to was Carmen Rivera. Also a good source for pens. 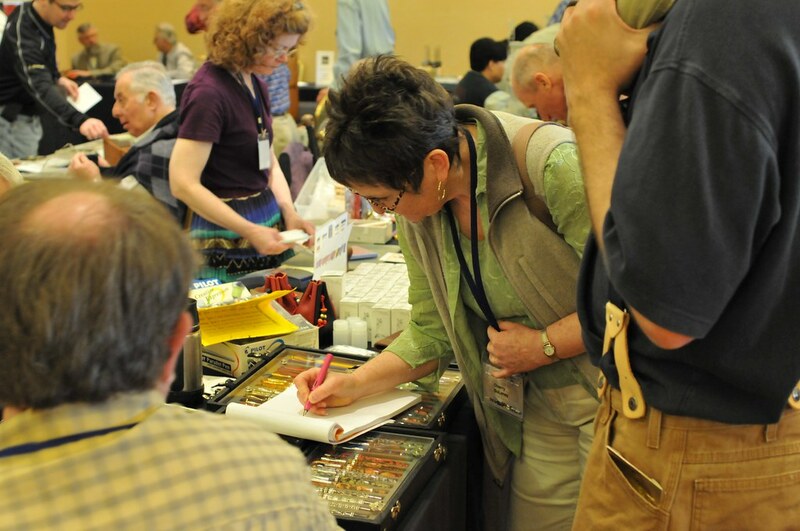 John was the only one working on nibs at the show. 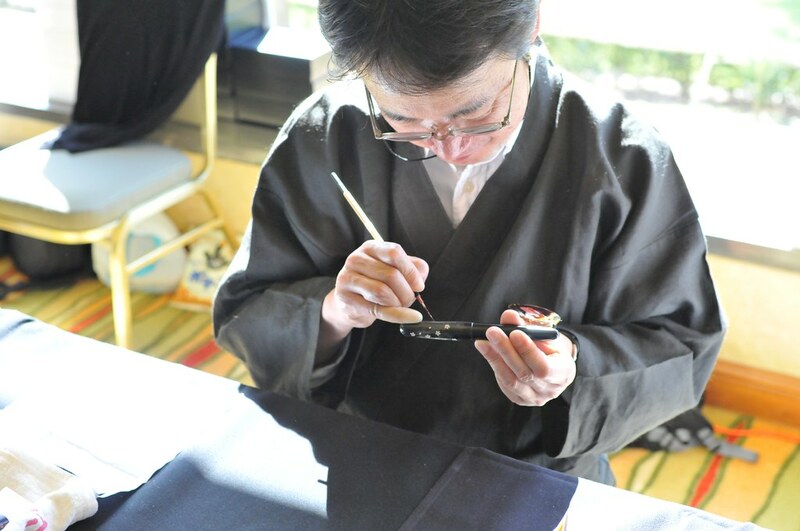 Here he is seen fitting my new Nakaya Neo-Standard with a nib. 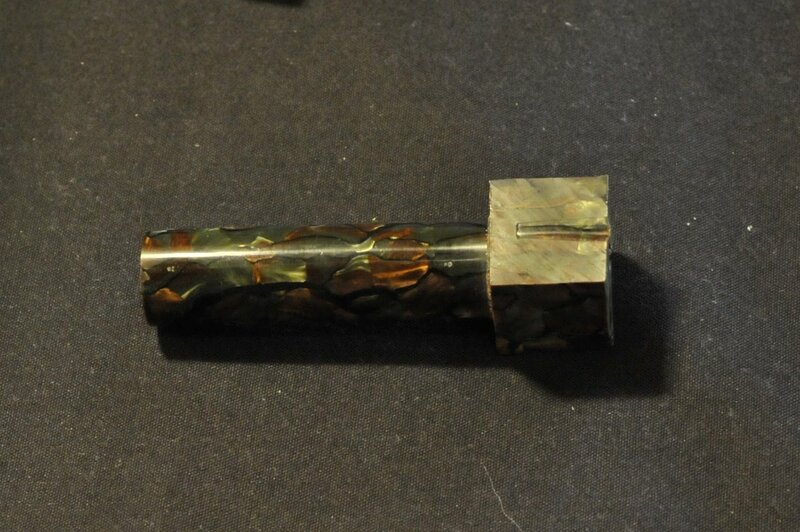 I learned from John that the Nakaya nibs require heating the feeds to fit the nibs. John had a hot water heater to do this fitting. 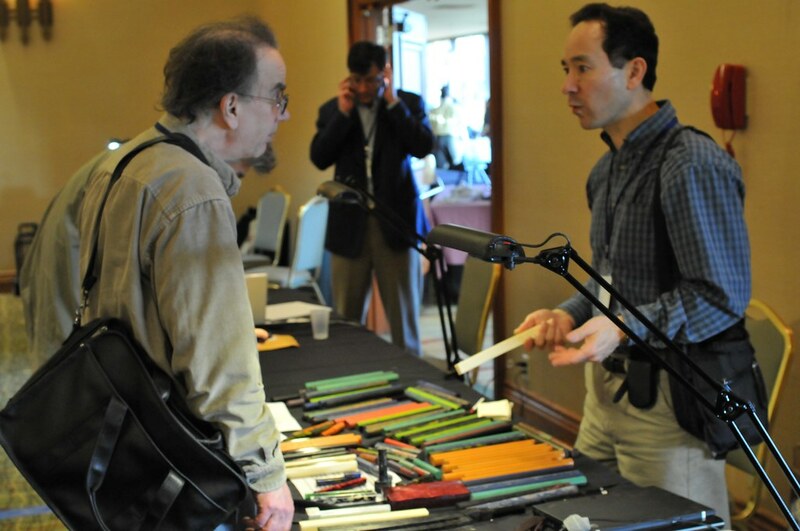 I asked him about it because I saw Mr. Yoshida of Nakaya doing the same thing to Leigh Reyes pen. 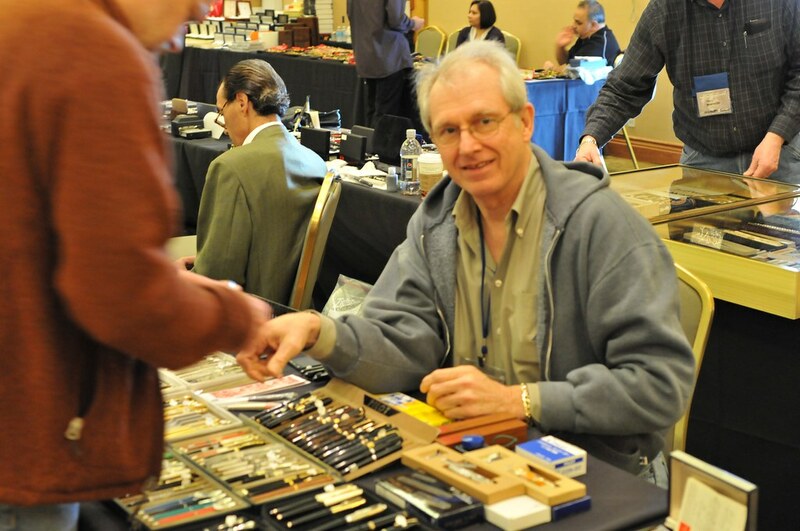 John also fixed a sprung nib on a vintage Pilot R pen. 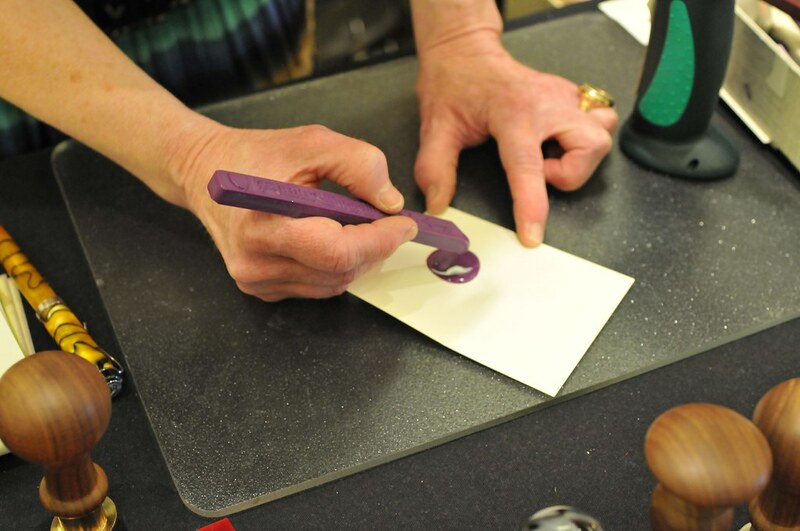 It was very educational watching John fix that nib. 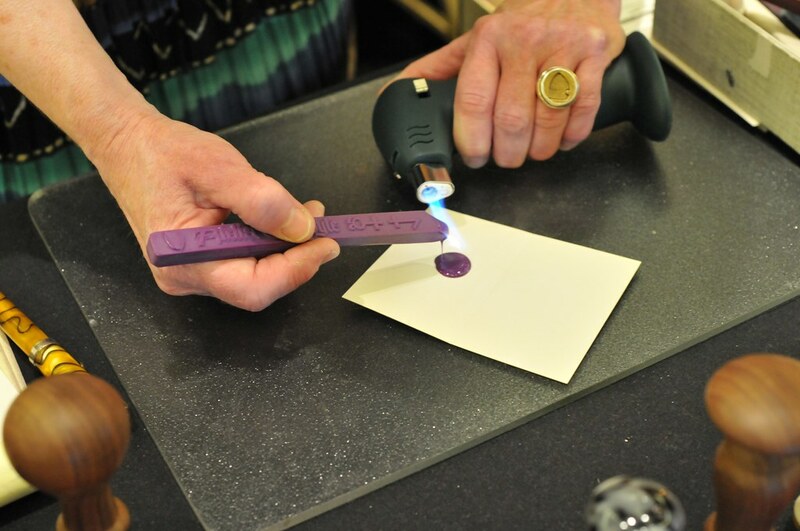 I had thought about doing it myself but stopped because I sensed that the nib and feed was not going to be easy to remove from the fragile section. I was right. 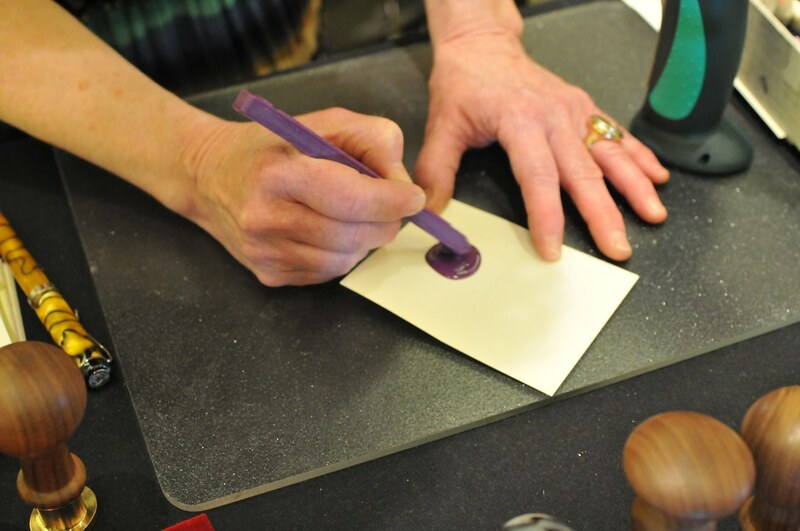 John had to do some magic to get the nib out. 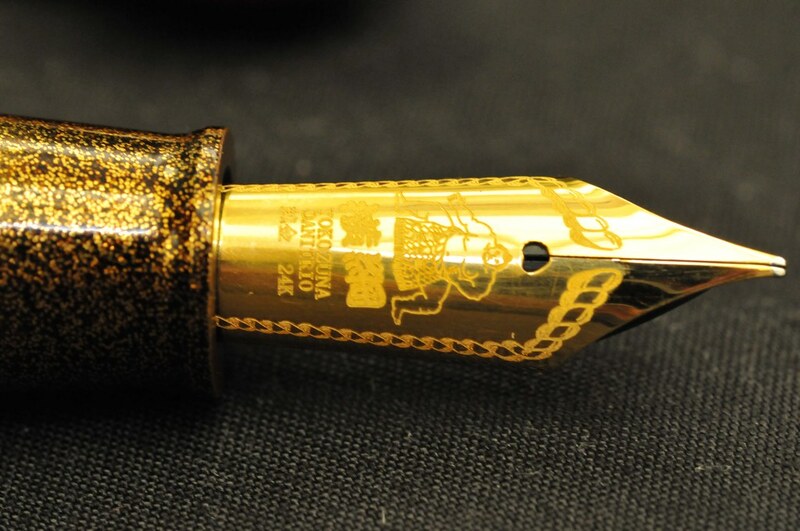 Fixing the nib was an education on nib repair. People always say bring cash. Several dealers did take credit cards. John was even better. He had a laptop and had my info in the database. He was able to charge my credit card and e-mail the recipt to me. Just like the Apple store. Very Dangerous. For those wondering about Ken Jones (formerly with Kenro), Ken is comfortably settled with Yafa. 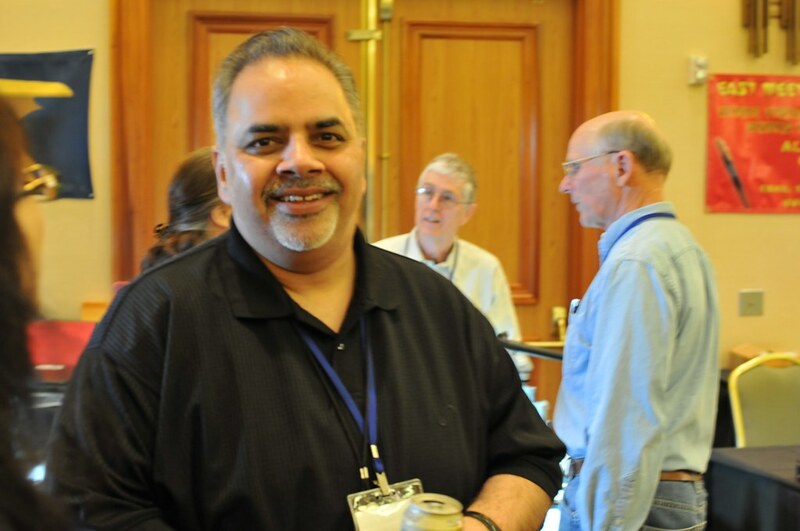 Yafa was a sponsor and had a big presence at the show. Speaking of Ethernautrix, this pic was taken only a few minutes after she arrived and registered. I think it took her only a few minutes upon arriving to buy a pen from Bryant. I at least waited several hours. Winedoc has had a big presence at the show. 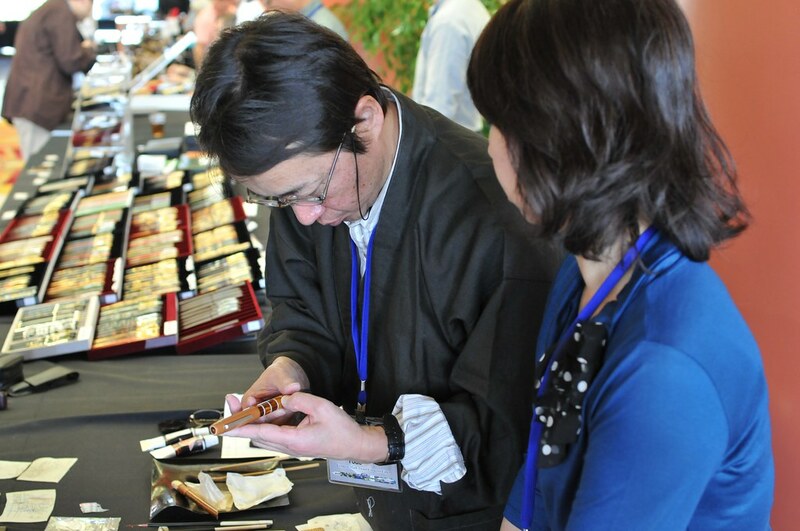 This year was special because the Maki-e artist who made the FPN Fellowship pens and his wife both attended the show and gave maki-e demonstrations. I'm posting those pictures in a separate thread. As always, Danitrio has something new to introduce. 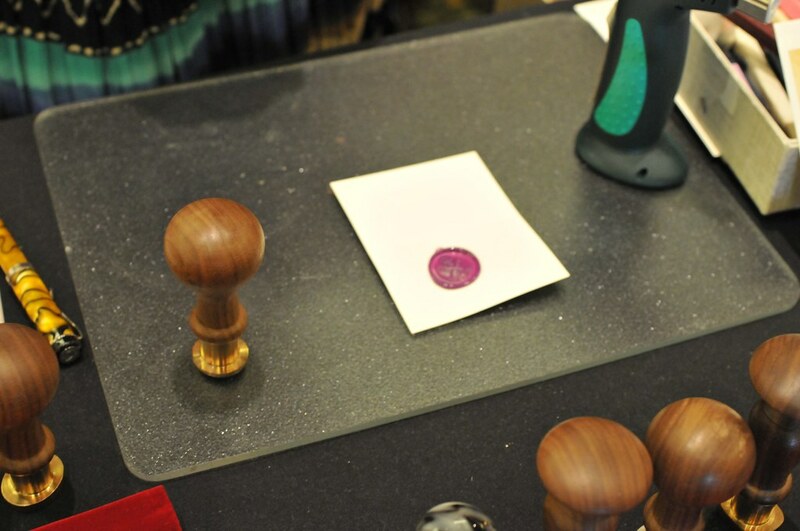 These are new urushi colors shown here in the octagon(FPN Fellowship shape) and genkai versions. 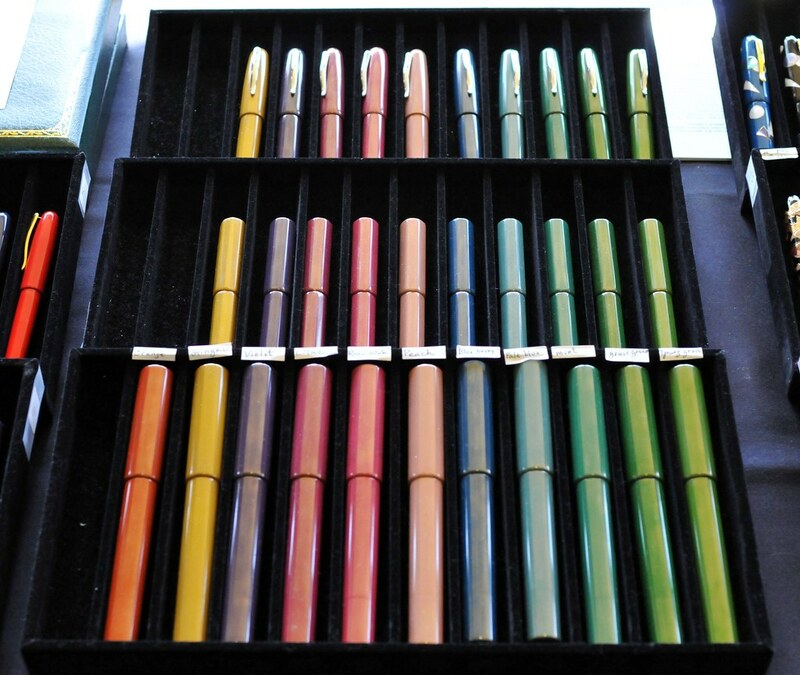 These are new urushi colors never used before. 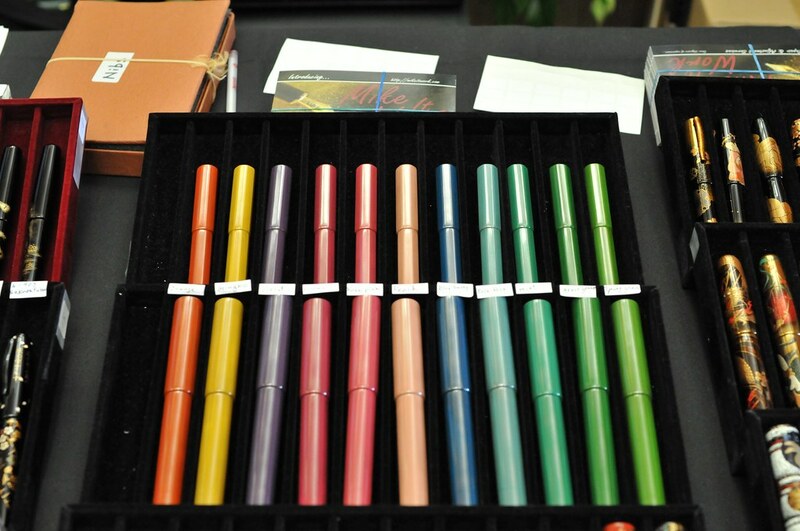 One individual bought the entire tray of the new urushi genkai pens as soon as they were put out. 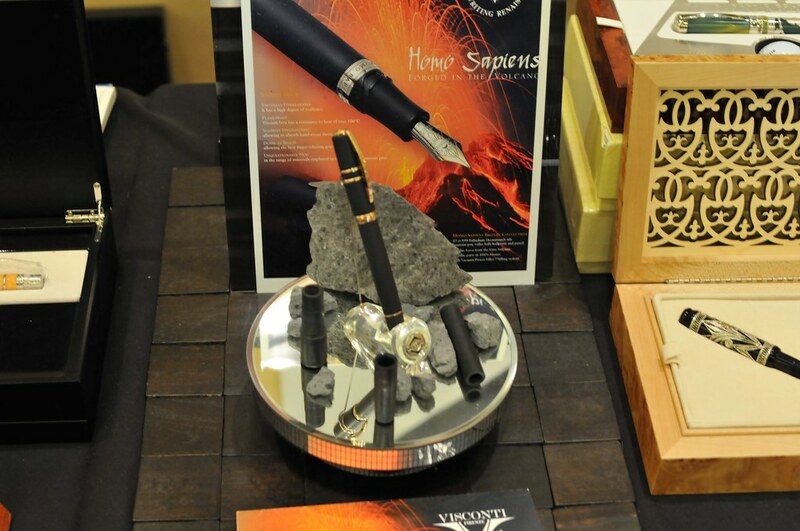 The new Visconti Homo Sapien (aka Lava pen). Too bad this one was a rollerball. Friday was a step-up in the action versus Thursday. 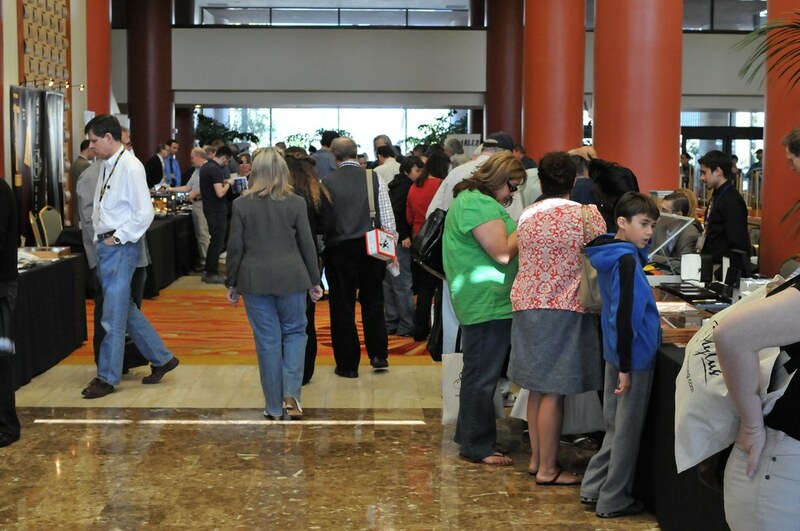 It was not very crowded so one can look carefully for pens and talk to the dealers. I did a majority of my damage on Friday. 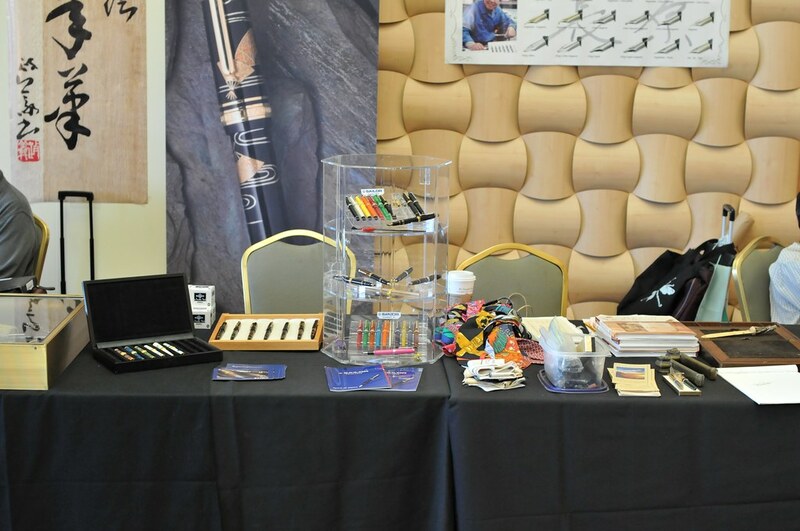 Now Friday was also special for the after pen show activities. On Friday, Winedoc had his party which included a union of the Bay Area Pen Posse and the LA Legion with some of the Minneapolis members thrown in. 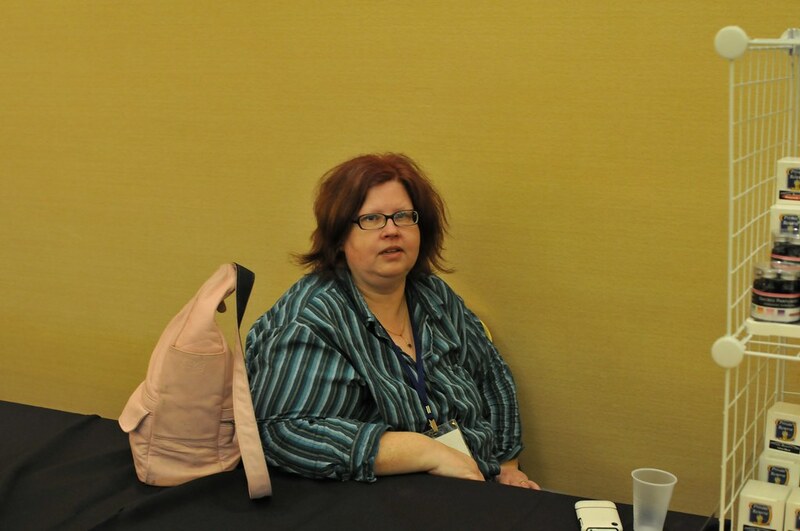 Rita Carbon has already posted her pictures of the event and I'll do a separate post with lot of pictures of FPN members. There was food and lots of alchohol. I think the Pen Posse blend brandy went over very well. Next year, I'll bring a case. After that party, Ethernautrix, Ron Lee, Shamouti, and myself went to chill with the self described "inner sanctum". This was in celebration of the birthday of "Parker75" (the name escapes me at this point). 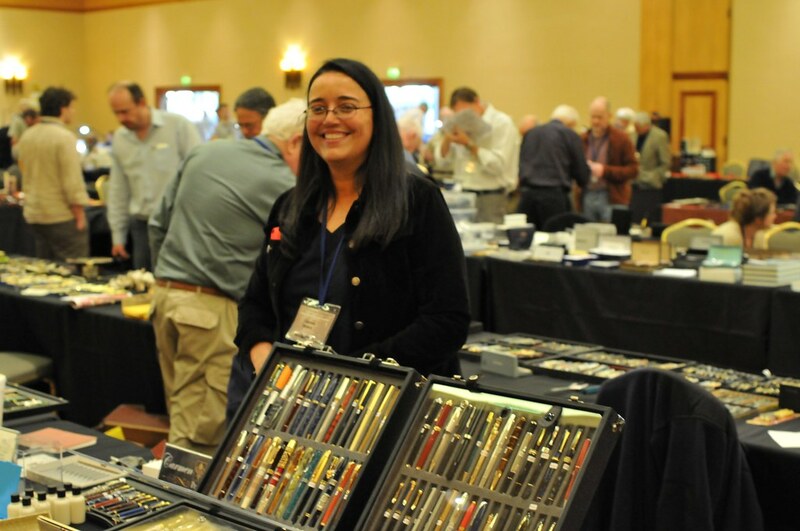 It was gathering of a lot of the very long time pen collectors and pen people. More alcohol and cigar smoking ensued. 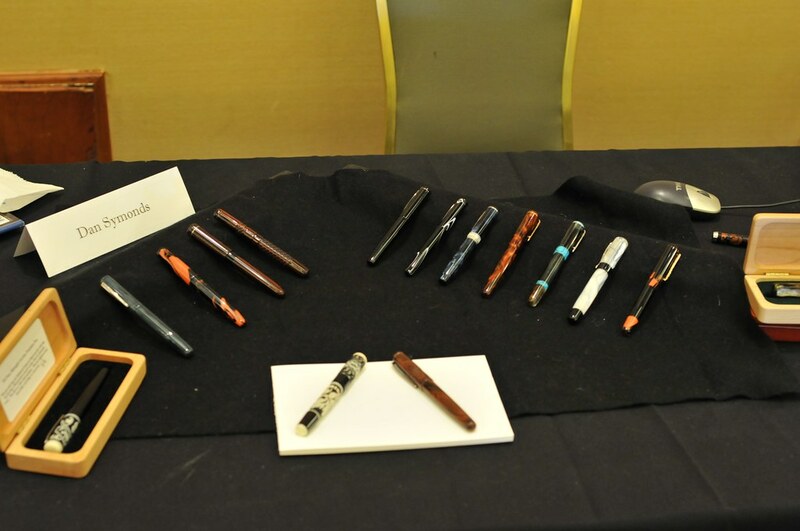 I learned a lot about pens that evening. 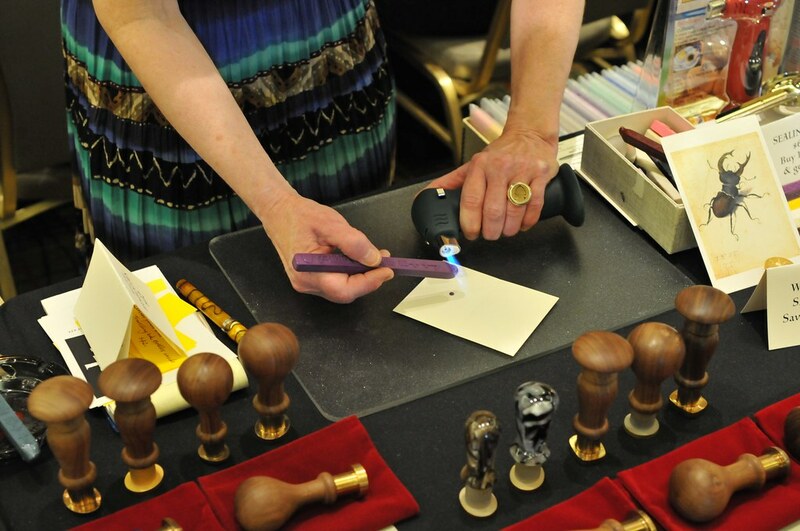 However, as Deborah of Toys from the Attic said, "What happens at the LA Pen show remains in the LA pen show". Edited by AltecGreen, 15 February 2010 - 06:13. Thanks for this wonderful account in photos and words. I was there, too, in my usual 'incognito' mode, and that was nice as well. But it's great to see just how much I actually missed, too! I felt like documenting the show. The camera bag did get really heavy by the end of Friday. I did find it very interesting how the character of the show changed from Thursday to today. I'll get to that in the next two installments. Thanks for the pics! I hope I can attend one day! Saturday: When will Ethernautrix leave for her road trip? Saturday marked a change in the show. The big distributors did not show up on Thursday and Friday but only reserved their table spots. On Saturday, they came in mass. 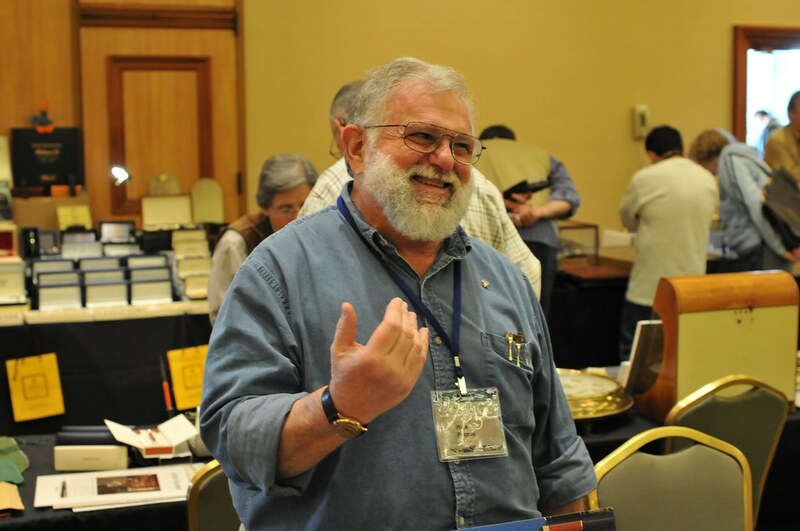 (Kenro, Yafa, Sailor USA, Fine Writing LLC, etc.) The only exception was Visconti (Coles) who were there on Friday. These guys distribute Marlen and soon to be Ancora (yay). Ancora is returning to the US market (I guess the Russian market has suffered a set-back). The guys there were quite enthusiastic about their products. 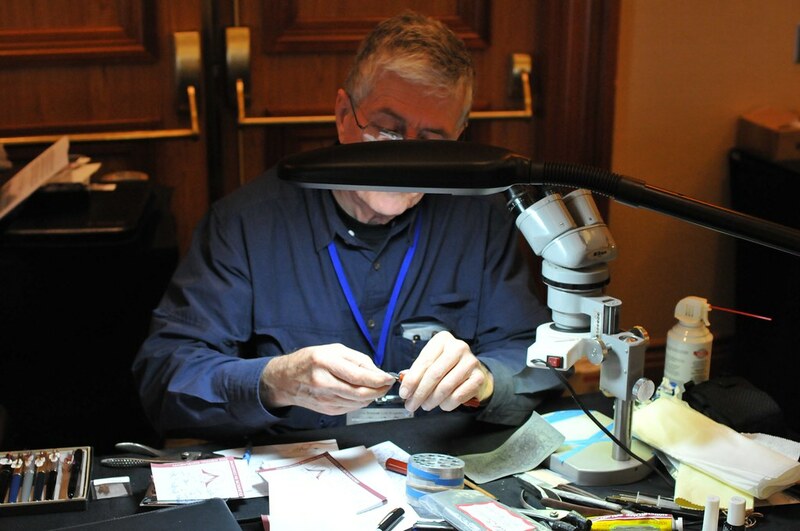 In addition to the big companies, a number of smaller custom makers were present. 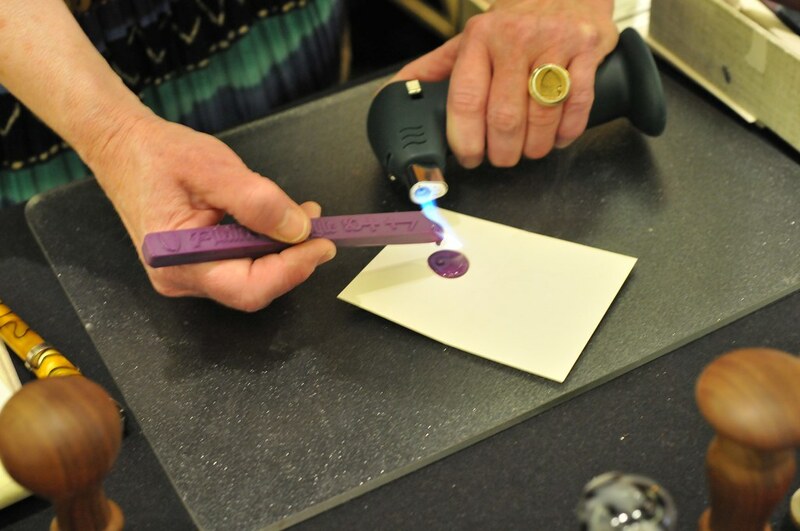 Dan makes very cool engraved pens. One of the coolest was a modern safety pen. 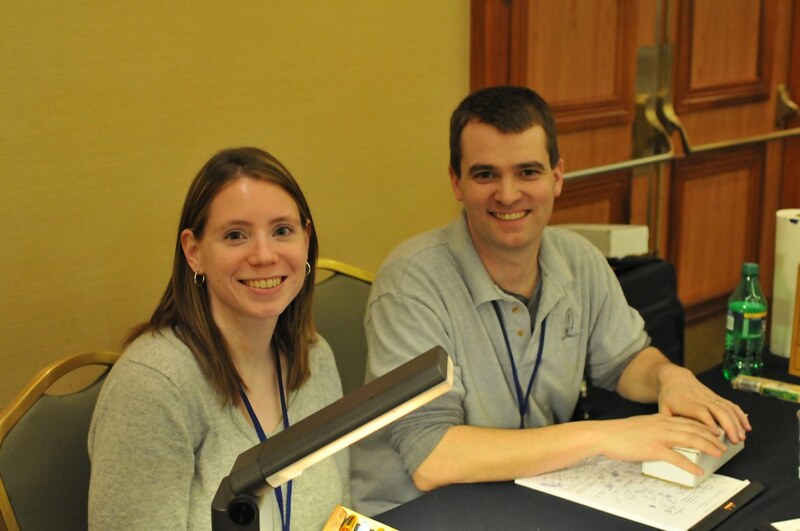 They were very excellent wet writers and gorgeous. 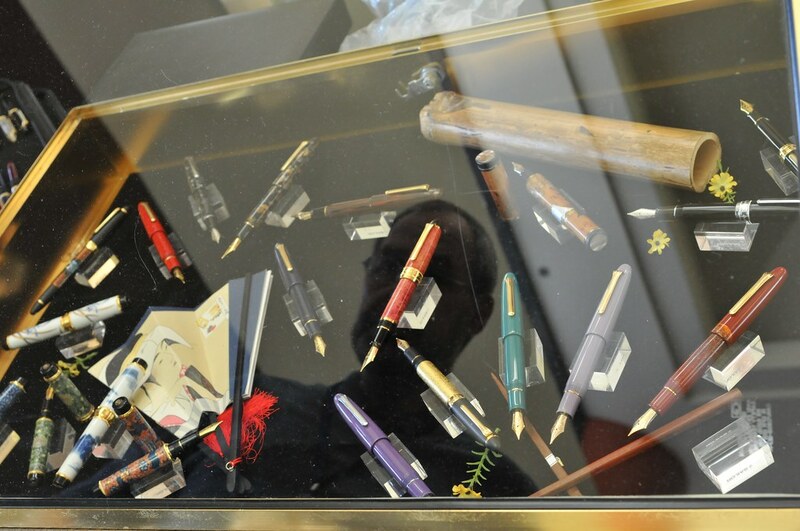 I would have bought one but Stan and his friends showed me a couple of pens I had to have. Here is Rick Propas in casual attire. He was in a shirt and tie on Sunday. 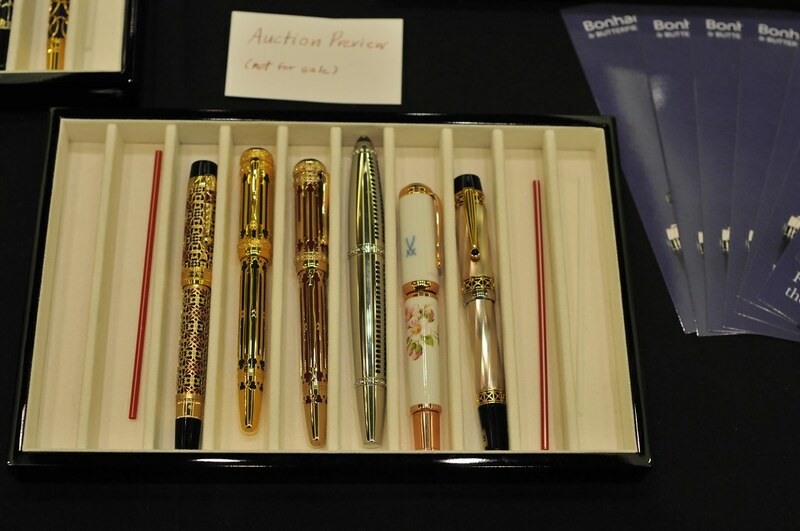 Rick is the consultant on the Bonhams auction on Monday and had some of the pens there. Here is Mr. Tatsuya Todo (Kosetsu) and his wife Wakako. Both are maki-e artist who wok with Danitrio. 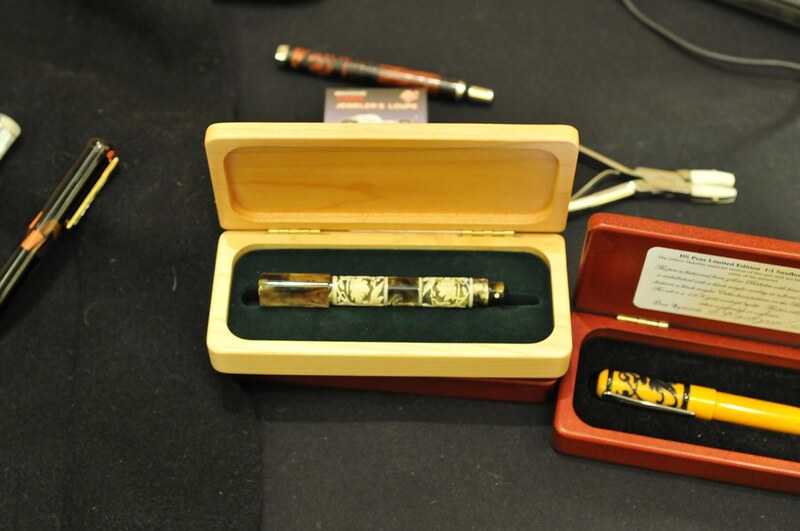 Kotetsu was he artist who did the Danitrio FPN Fellowship Pen. 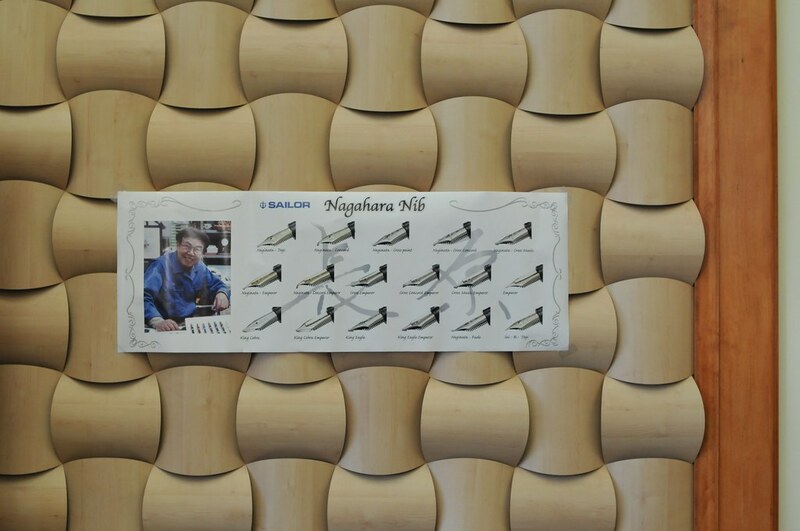 On Saturday and Sunday, they did maki-e demonstrations. More on that in a separate post later. Here is a pic of the maki-e artist examining the work of Paul Rossi. 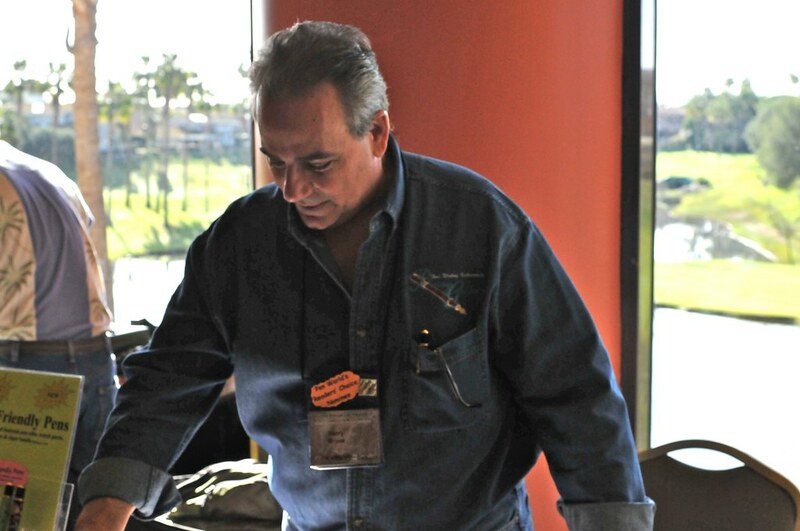 Here is Paul Rossi showing pictures of his work to Kotetsu and his wife. After a while all pens start to look alike. 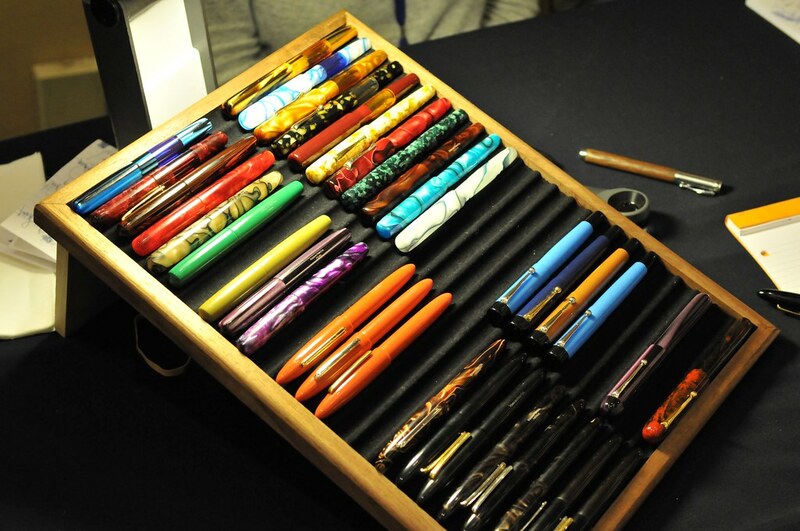 The show really can be pen overload. It was a good thing I had a mental priority list and stuck to that list. Now if I could have just stayed on the Plan A budget instead of going to the plan B budget. Saturday was busy but not as busy as expected. I guess the economy is taking it's toll. It was a bit slow in parts of Saturday afternoon. Still, I did manage to some major damage on Saturday. I woke up and went to the bank (that was plan B ). And eventually, Ethernautrix did leave for her road trip after two and half hours of trying to leave the show. I leave you with this last image of Saturday. I don't want to comment although there is a version of this picture with me in it. And I'm a bit glad it's blurry. I had dinner with a friend so I missed the post show activities that evening. Darlene (pictured above) went with Roger Cromwell to this bar. I did see the incriminating pictures of the event on Sunday. Edited by AltecGreen, 15 February 2010 - 19:06. So today was Sunday and the public day of the show. The show today was very different than the past three days. 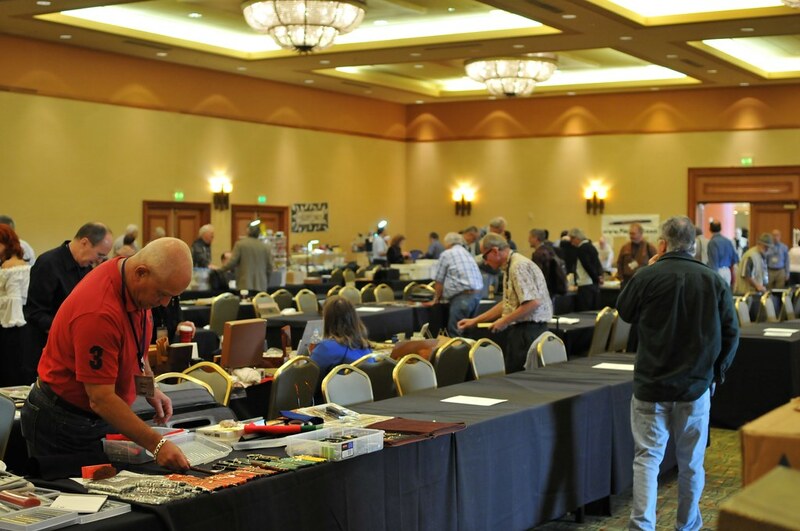 First, the tables are now not cheap but $160 each and the locations are pre-assigned. 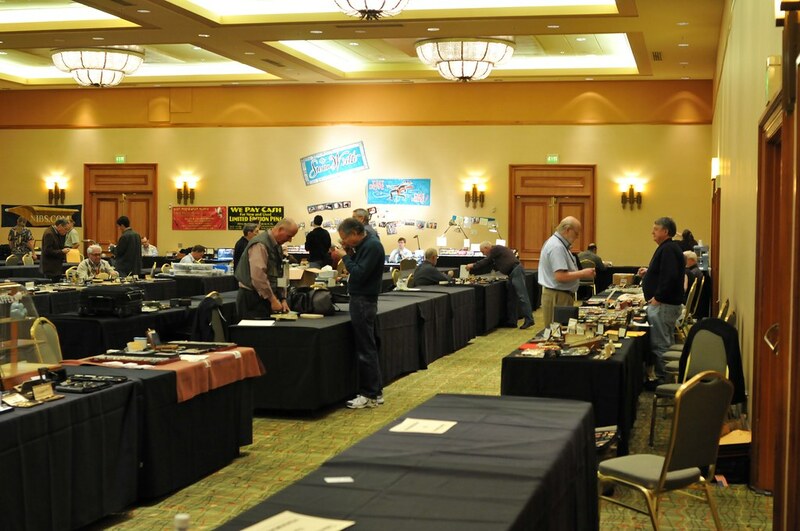 A lot of the vintage guys from the past three days did no show today or have already left. 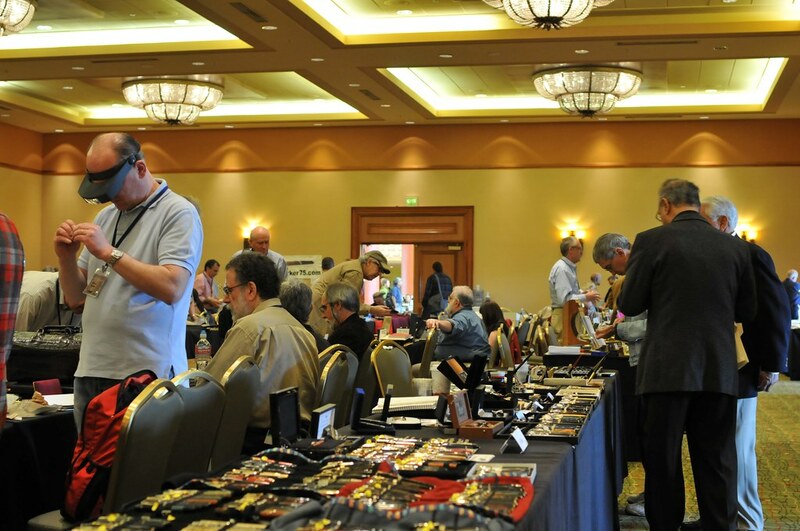 There were a bunch of dealers who only come on Sunday. So the show is very different. Feel free to compare the pictures of Sunday with the previous three days. I got up extra early this morning. 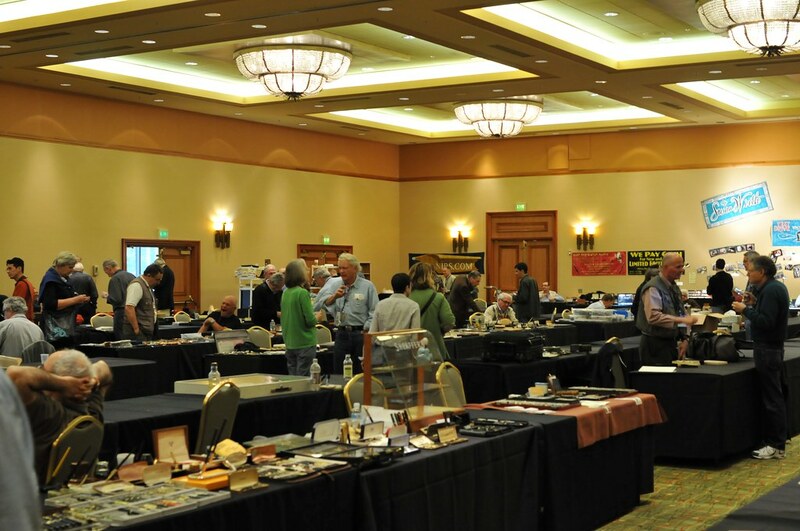 Unlike the other days, the dealers were up early and taking Sunday very seriously. I was told they do more business on the public day than the other days combined. It seemed very true. 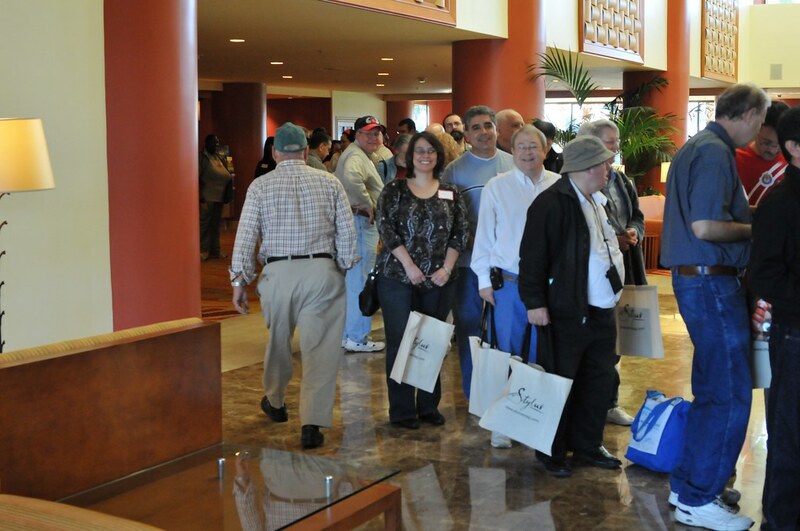 John was not too busy the three previous days but here the crowds line up for pen work. Ward and Linea was not at the show Th-F but showed up today. 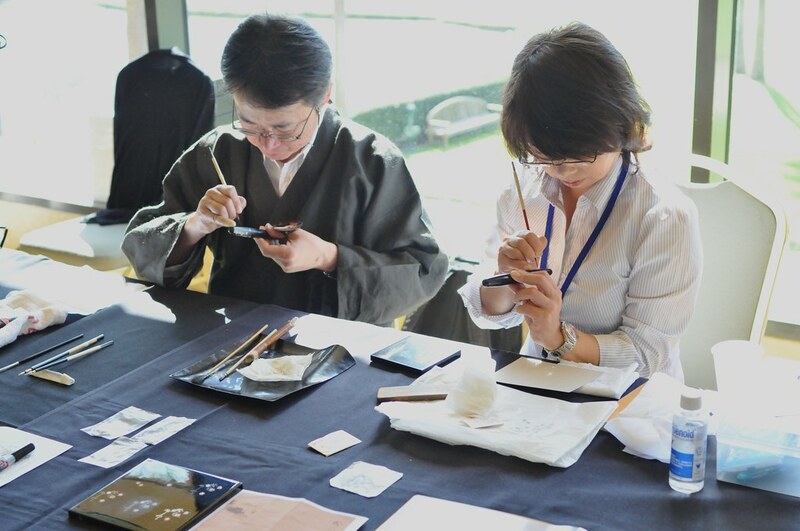 Lisa and I spent a lot of time with the two maki-e artist. 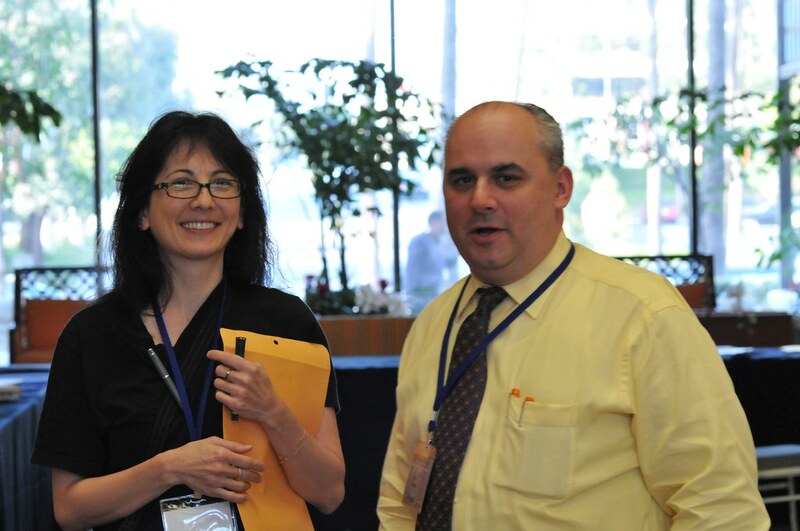 I think we both acted as story tellers and related the whole FPN Fellowship pens to a lot of people this weekend because we both own the pen. 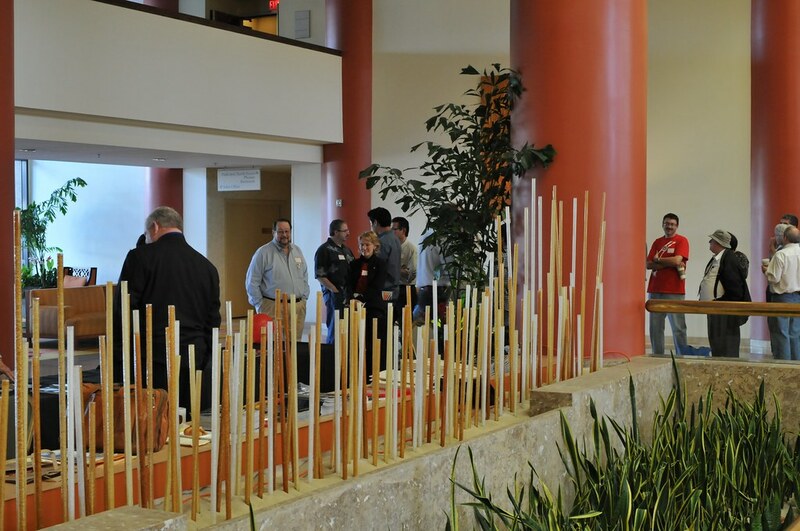 I spent a chunk of time explaining the maki-e to some of the attendees today. So that was Sunday through noon. I had had enough and started the drive home. All in all, it was blast. 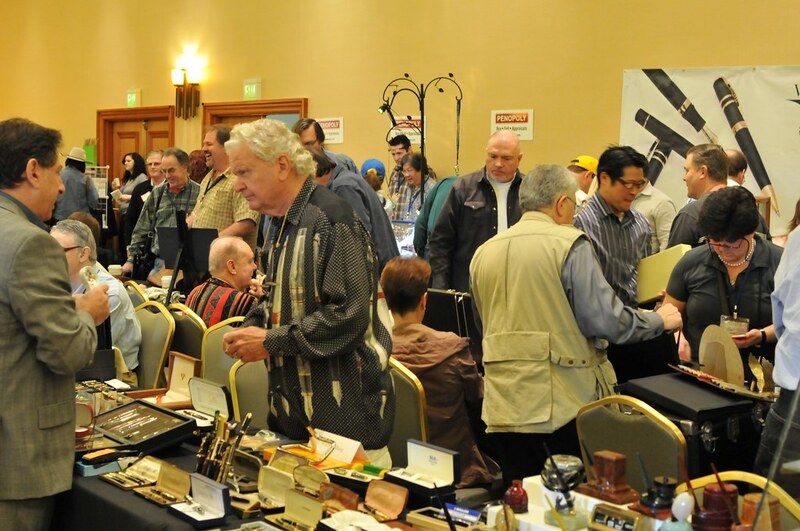 I think that the show is most enjoyable on the trader days. Today, the show was way too crowded and busy. It was hard taking pictures because people were all over the place. I tried finding more FPN members but it was too chaotic. 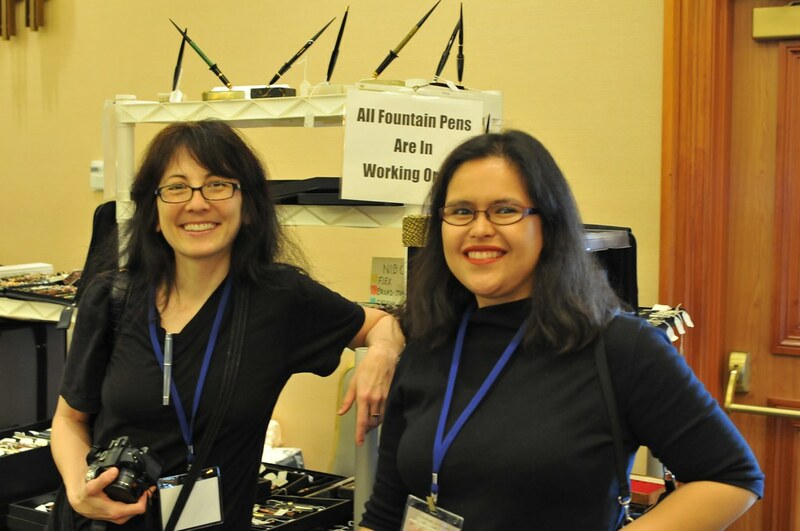 The best part of the show was spending time with fellow FPN members (especially the party) and meeting all of the characters in the pen world. 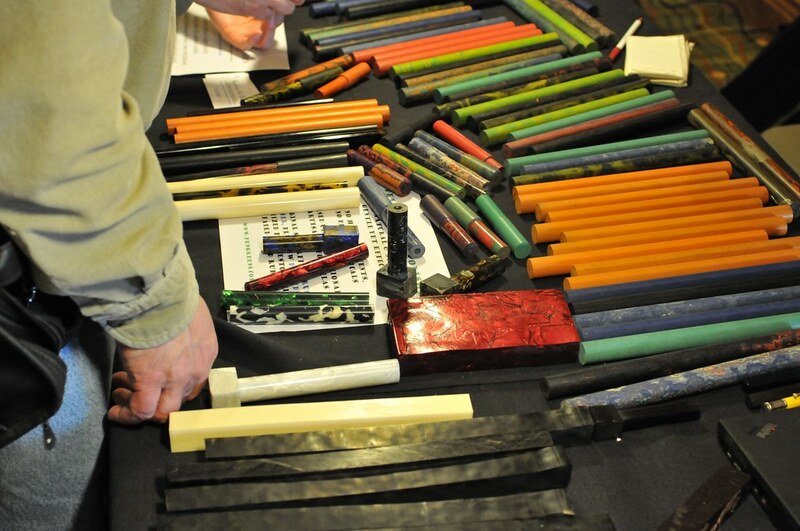 It was like a giant Pen Posse. 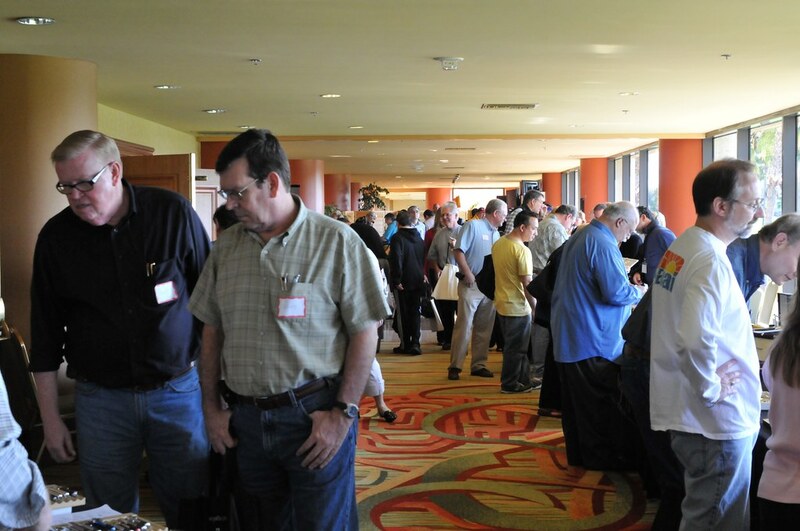 Today, it felt more like other trade shows and conventions. I think the LA show takes on the character of the organizers. 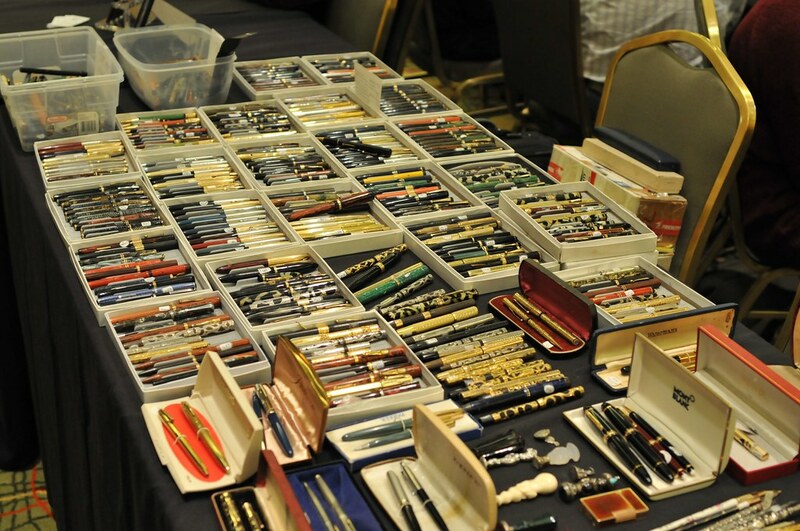 This show is incredible for vintage and used pens. 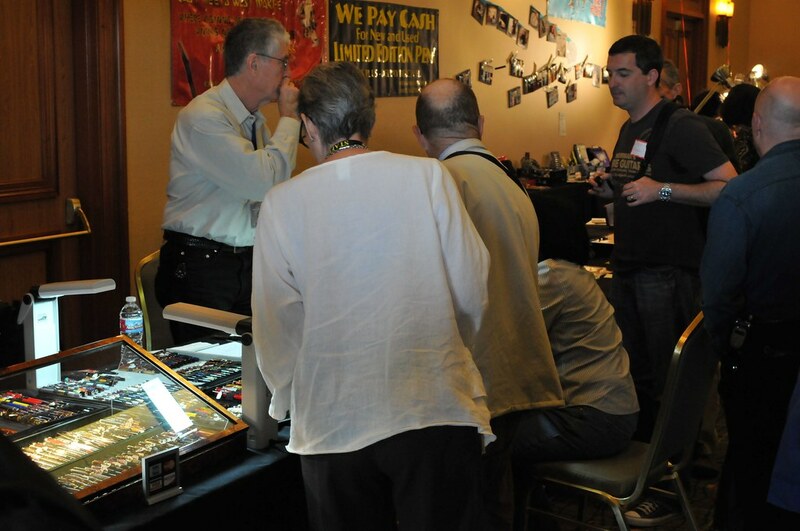 The regulars have incredible knowledge and expertise. Modern pens take a somewhat back seat until Saturday and Sunday with the exception of Danitrio who always have a big presence in LA. 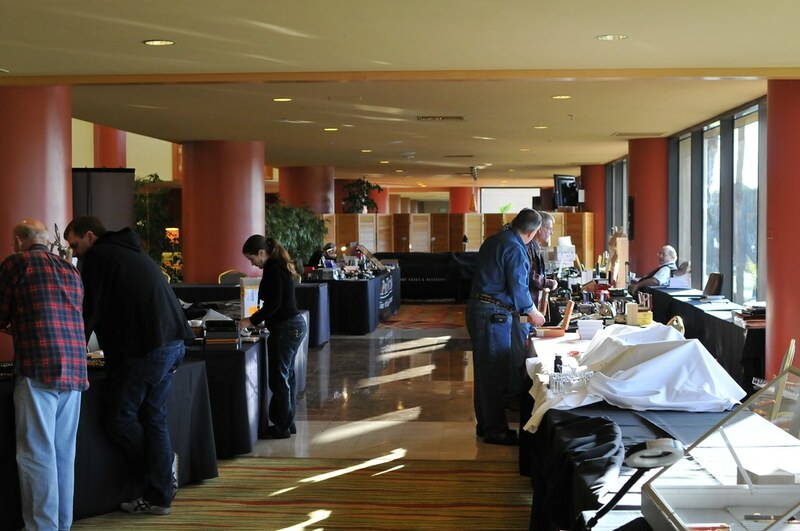 Many of the east coast shows are organized by retail stores and have different focus. In the advice thread, there were some comments about dealer behavior today. Unfortunately, it's true. 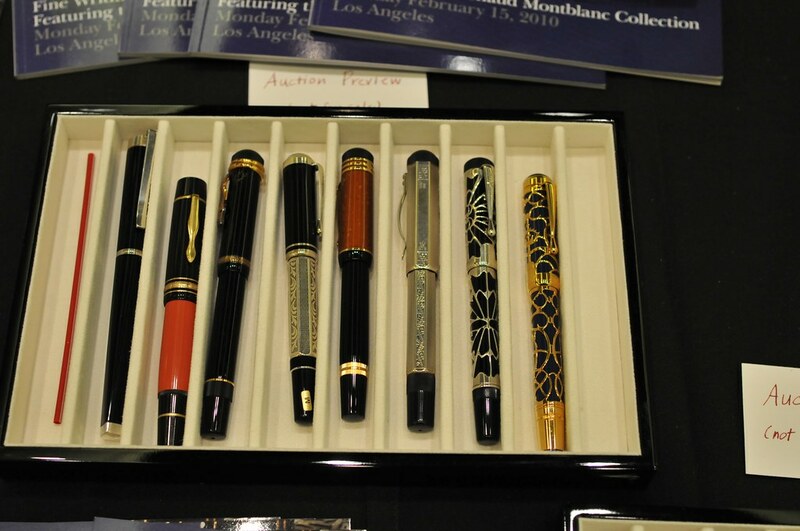 The Montblanc guys near the registration desk only showed up today. They seemed to have a bit of an attitude. Bargains can be found but it's hard with such a large crowd. I do recommend those who only came on Sunday to pay the extra amount and come on Friday and Saturday. You'll have a much different experience. 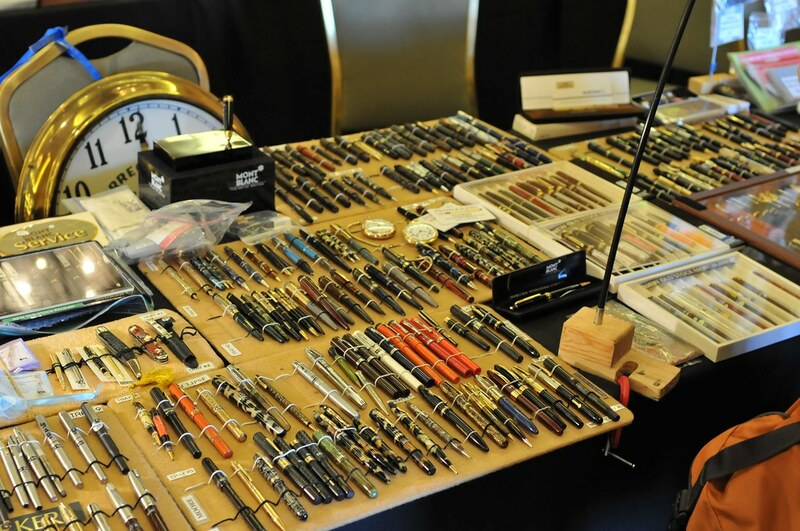 I've only been collecting pens for about a year but at this show I felt as if I've been doing it for years. 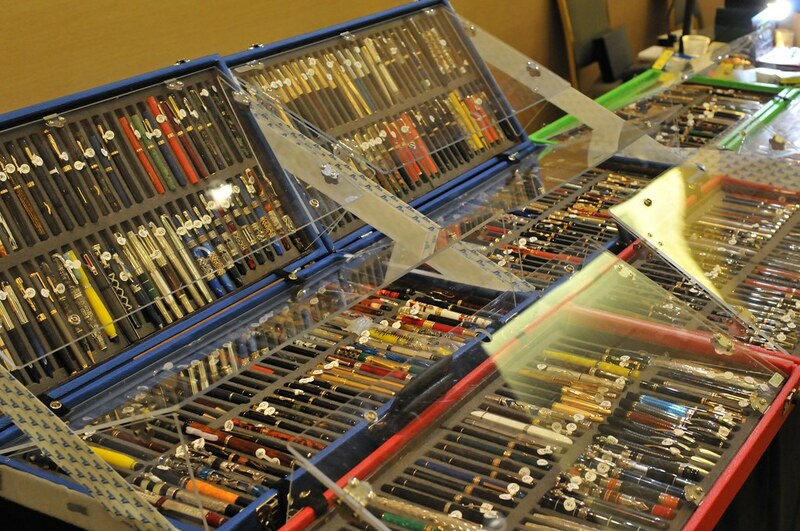 By Saturday, dealers knew me by name and was looking for me to show me pens I might be interested in. I was chatting with one of the old timers today and he asked me to identify a Japanese pen. 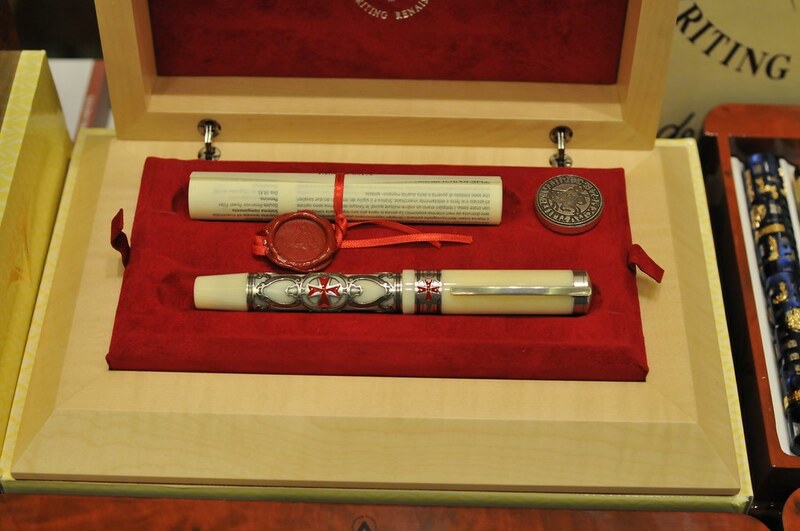 I bought that pen for $50, it was a sterling silver pen made by Sailor under contract to another company. So you can find bargains. 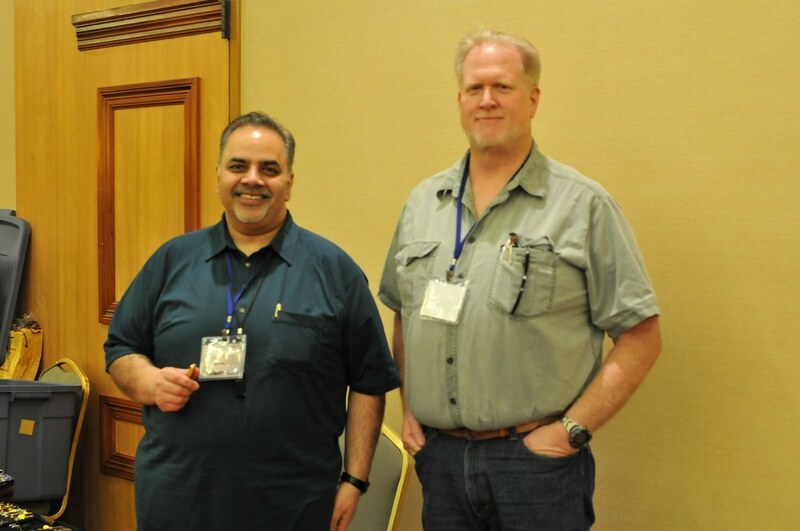 The highlights for me were meeting the two maki-e artists, Winedocs party, and hanging out with the "inner sanctum" and sharing these experiences with fellow FPN members. Edited by AltecGreen, 16 February 2010 - 03:51. Edited by Jopen, 15 February 2010 - 09:27. Really an exceptional show review. ! You need to go to all the shows and write reviews and take photos. Outstanding job! Thanks. Location:how important is it, really? Awesome report and photos! It's great to be able to put names and faces together. Thank you for this fantastic report! It's a great service to the rest of us who can't come. Very nice report on the show, you really captured the vibe how each day has a personality of it's own and how it can be a bit of an overload at times. Cannot wait until next year! 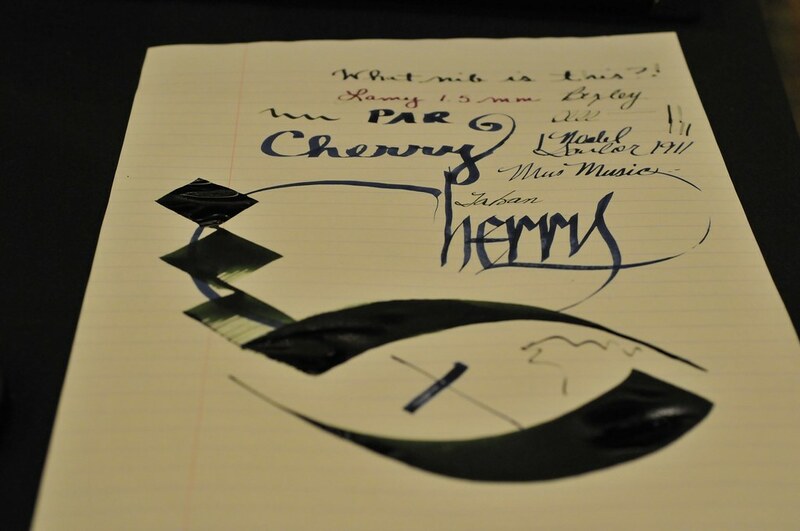 Swimming in a sea of Noodler's Navy! Equal Opportunity Ink and Fountain Pen User. Thanks for the awesome report. It was great meeting you. Major Web site update. 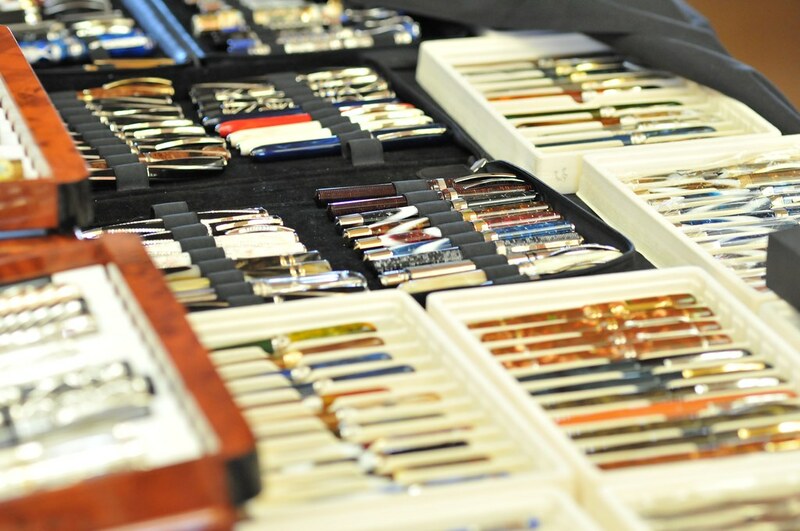 Over 100 newly-listed pens. Check out the New Arrivals. Oh, go to Atlanta. 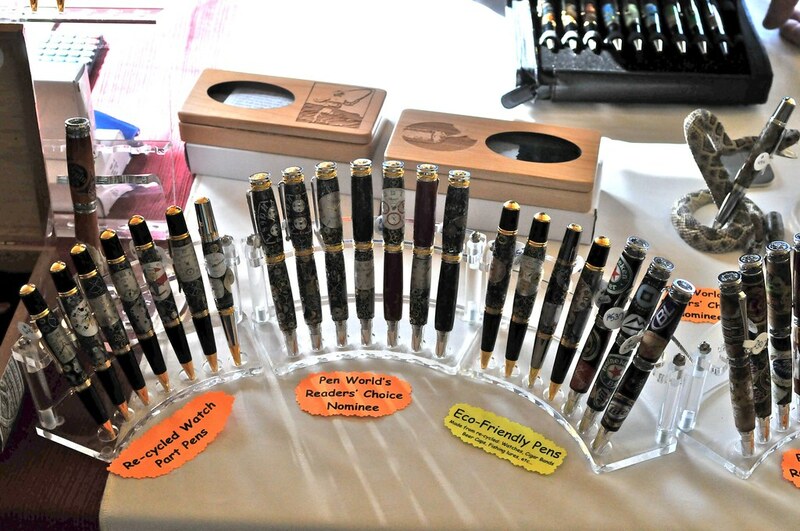 I live about 60 miles north of the city and I'll be going to the Pen Show in April. I can't wait - and maybe I'll get to meet you.